I had a small accident at work where my blue beaded lanyard went skidaddle. All over the floor. Not a real accident, I am fine, even if my beaded lanyard sorta died. This used to be a necklace. The sacrifice of my beaded lanyard prompted me to make my own lanyard for work. But I ignored the whole thing for a while. And now I finally needed to bring the idea to the forefront. How to structure the idea? Will one piece of fabric do? Will I actually figure out how to use my sewing machine again? Will Roger ever get out of the trunk that Jessica put him into? A bit over-dramatic way to say, yes, I’ve had an idea to make a lanyard out of a physical constant for a while. But which one to chose? I consulted a list I found online to help remind me of my nerdy past. 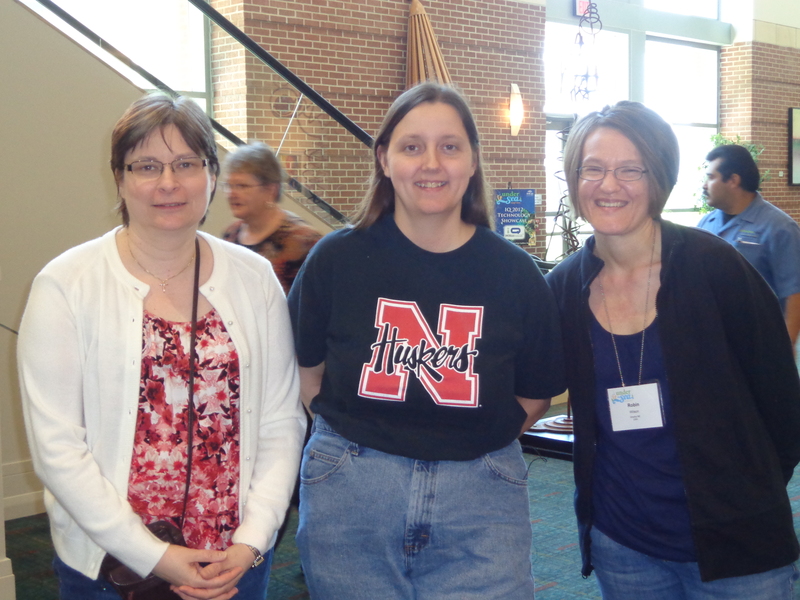 And then asked my quilty friends to see if they liked anything on my list. Okay the list was more simple than that. And then a quick poll, and then I found I liked one more than the others even with the poll. And then “A Lanyard” was born! 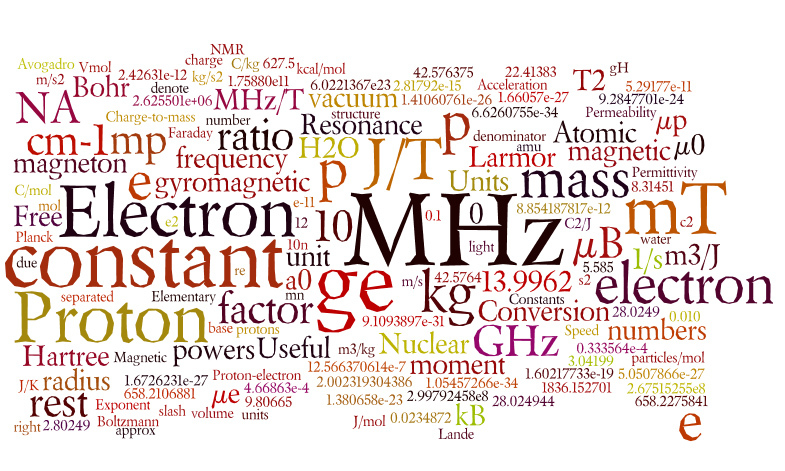 Can you guess which constant that I picked? And then, here’s a picture of the fabrics close up. I wear red a lot so I thought it would compliment several of my outfits. And no I don’t have many in process pictures. You fold in half. Lengthwise. 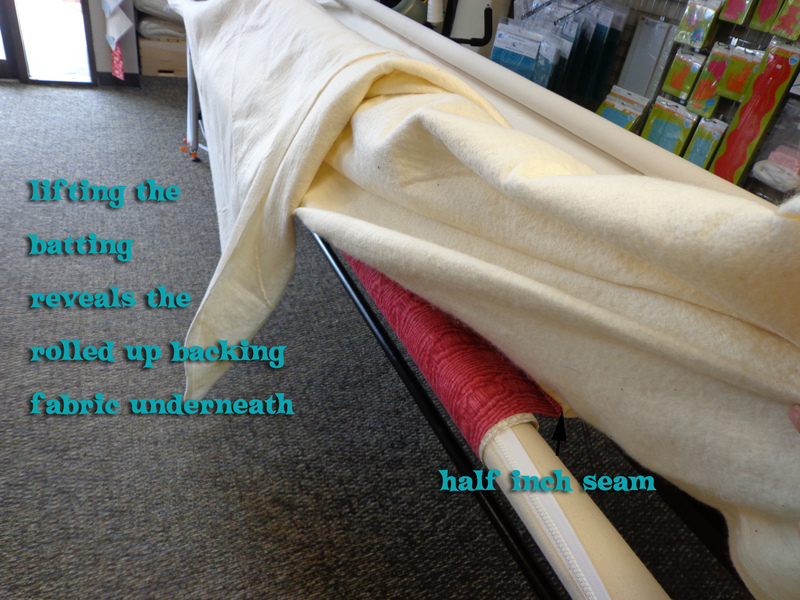 Then open up the seam & fold in 1/4ths. So you get this skinny skinny strip (start with 4 times the width of strip that you want. 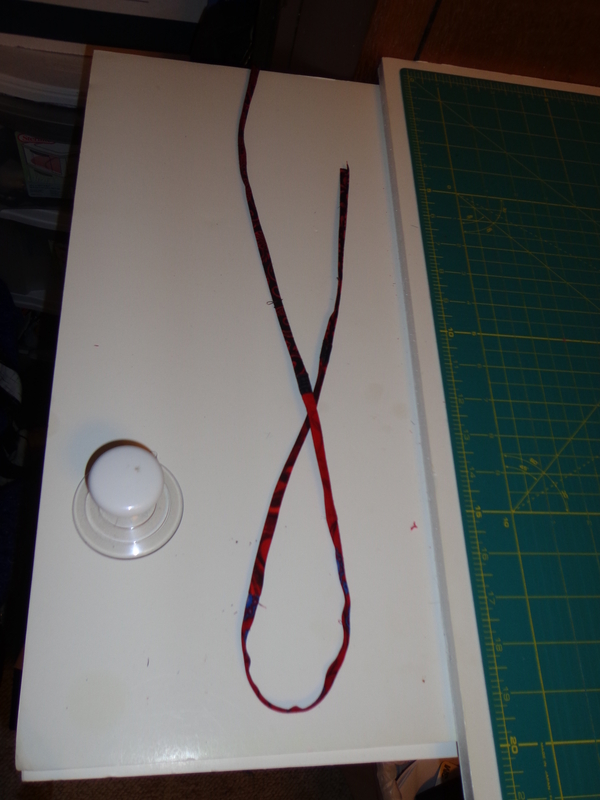 And then you sew the ends down really good around the lanyard piece that you have to work with. Excuse the blur. And the fake wood paneling. 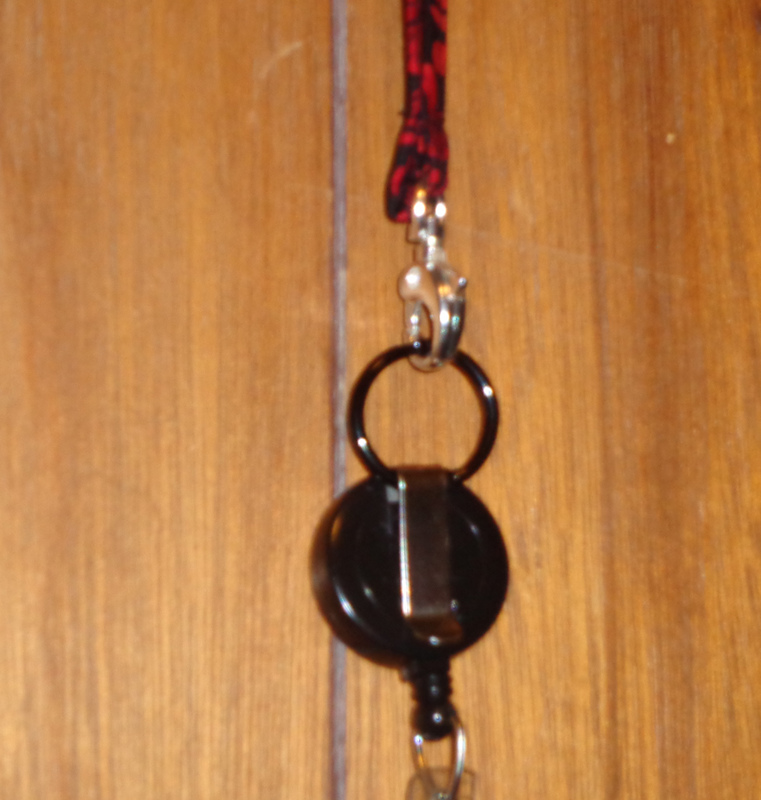 Here’s the lanyard in total. And now I have a secret # associated with this lanyard. 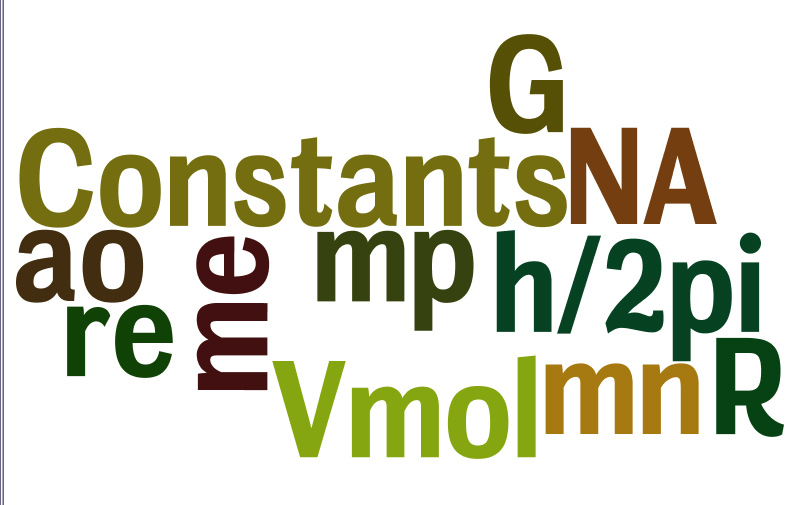 Maybe I’ll make the 2nd highest requested scientific constant and then rotate? You may want to make one for a new teacher for the year, or make one for yourself. Within the last month, I have had 2 unique experiences with my Guild. 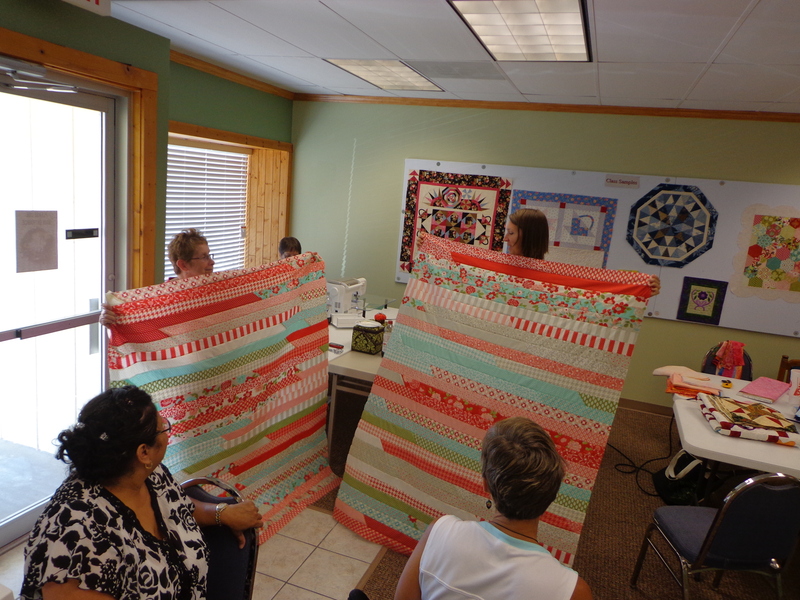 The First is the Jelly Roll Race Day of which I did not participate, but watched several quilters make an easy quilt in an afternoon! I go into some details about this in the podcast itself, but a few things I learned follow. 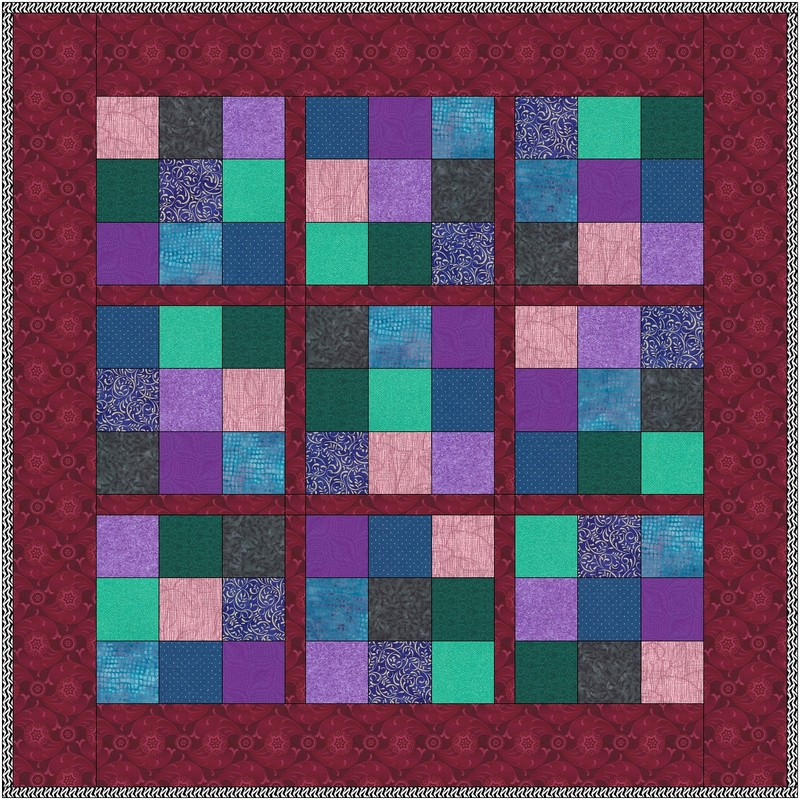 Accent fabric can be fun change to the Jelly Roll race look. Don’t forget to cut off the beginning strip – about 18 inches. The magic of the pattern is that you don’t know what it will look like, & some people are OK with that. 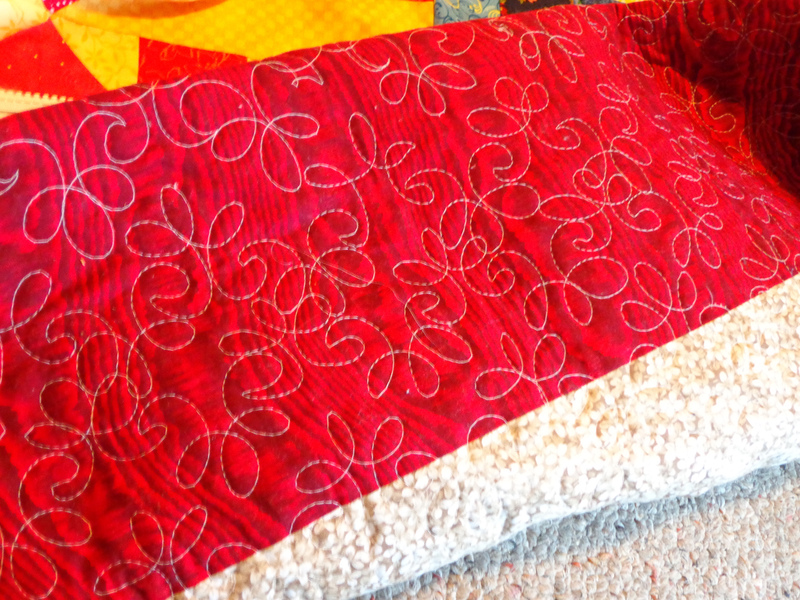 A person could theoretically calculate different sizes of jelly roll quilts, but I am not going to do it myself. 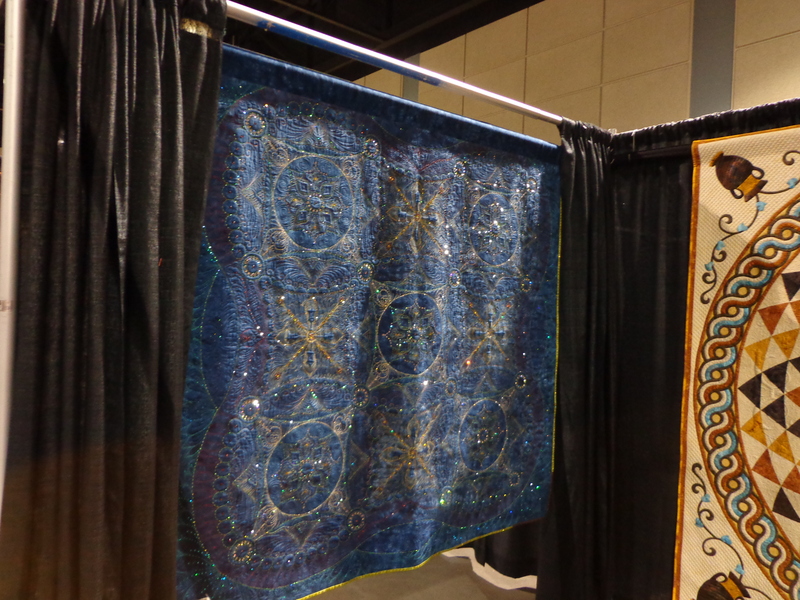 One of these was rearranged, but it’s so close to the same quilt here. 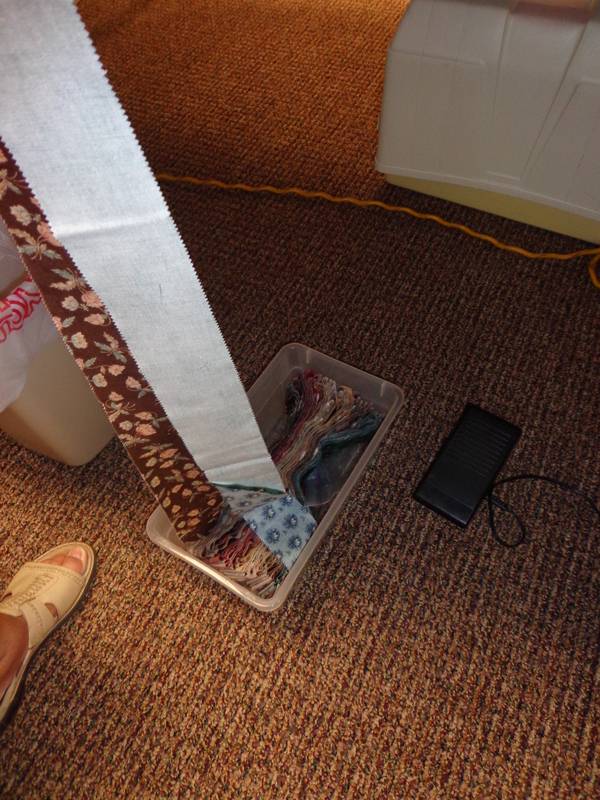 How to cope when the jelly roll is too small. Add a layer cake or so! These strips are longer & wider than traditional strips! 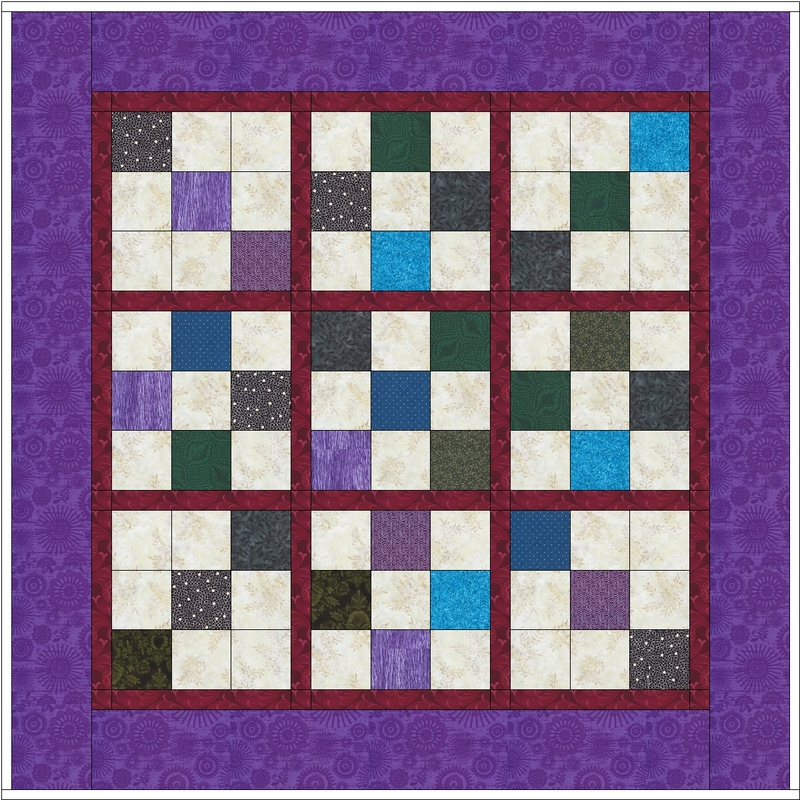 This quilt is quite wide due to the extra accent fabrics in the quilt. 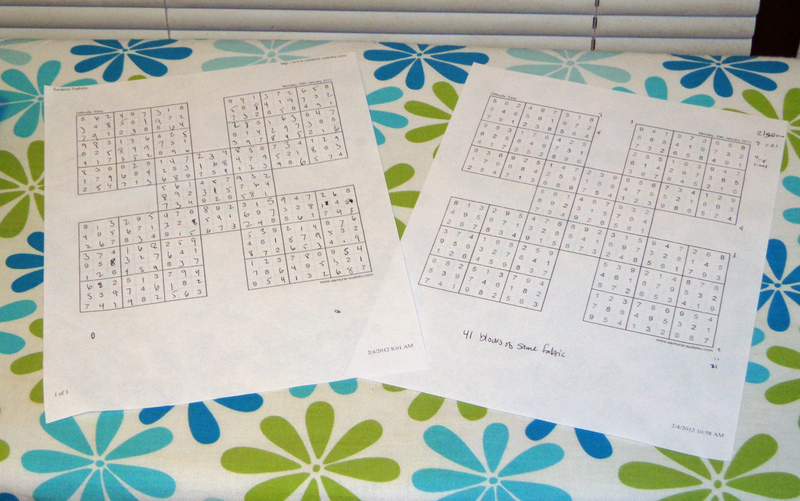 I looked up some sites this AM to see if anyone else had calculated the jelly roll quilt math, and I found a few sites. I have not double checked any of these so cannot verify to the methods’ accuracies. The second thing I did with my Guild is I participated in the Guild “show off your Works in Progress day” instead of a speaker. 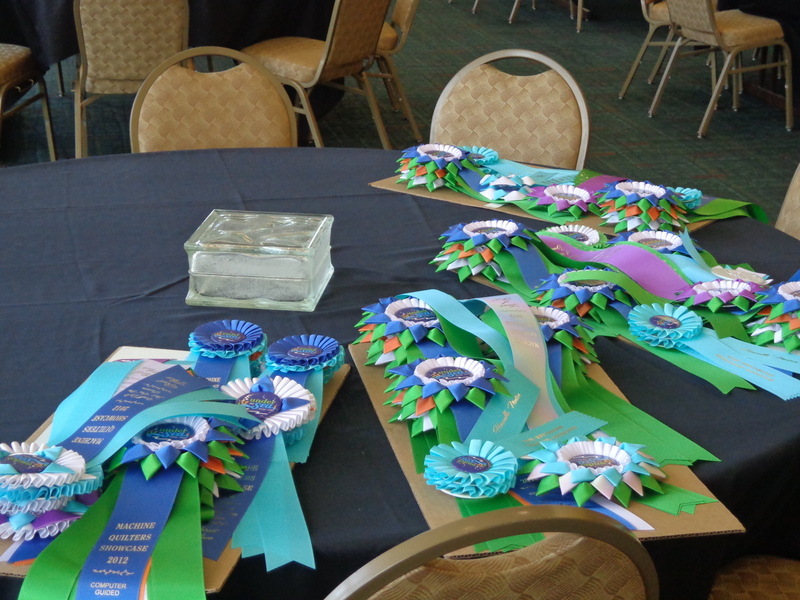 I surely brought the most projects of all of the people who attended! I still am really (unnecessarily) nervous in front of a group of really great & supporting people even when I can now rattle off a podcast (finally) without showing my nerves too much. I love that it takes all kinds of people & quilters & quilt styles about finishing projects and that is what makes this hobby incredibly amazing!!!! Not everyone makes tiny wallhanging sized quilts, most people make them for their bed. 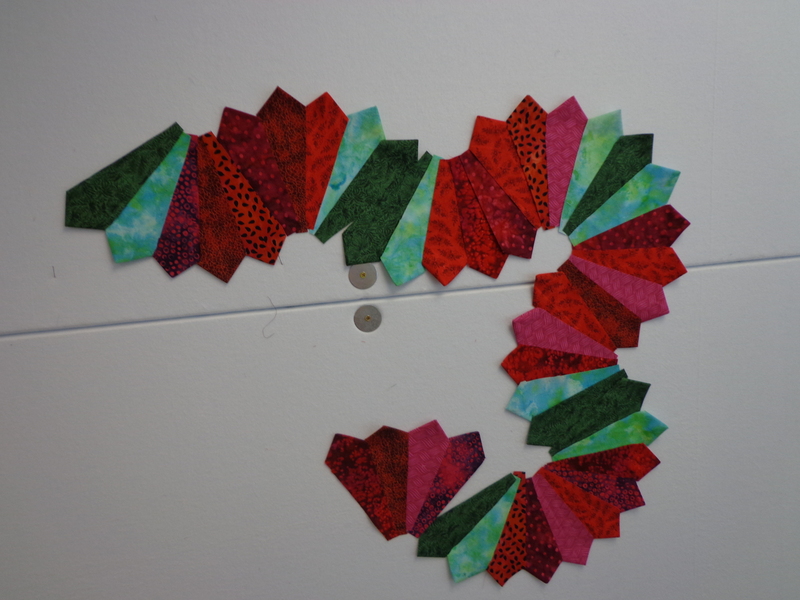 And my new project for the guild sewing day, Jelly Roll Strip Dresden blocks. 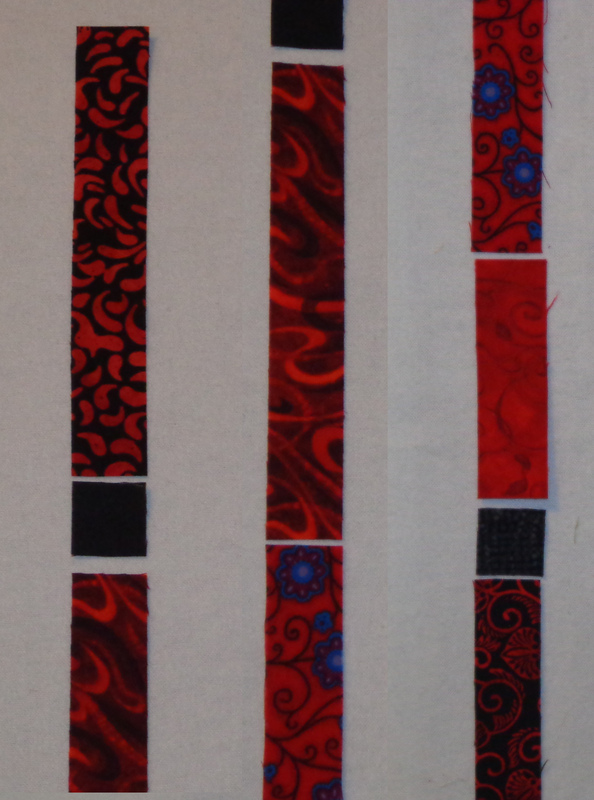 Jelly Roll strips I cut about 7.5 inches long, then sewed the narrow side. 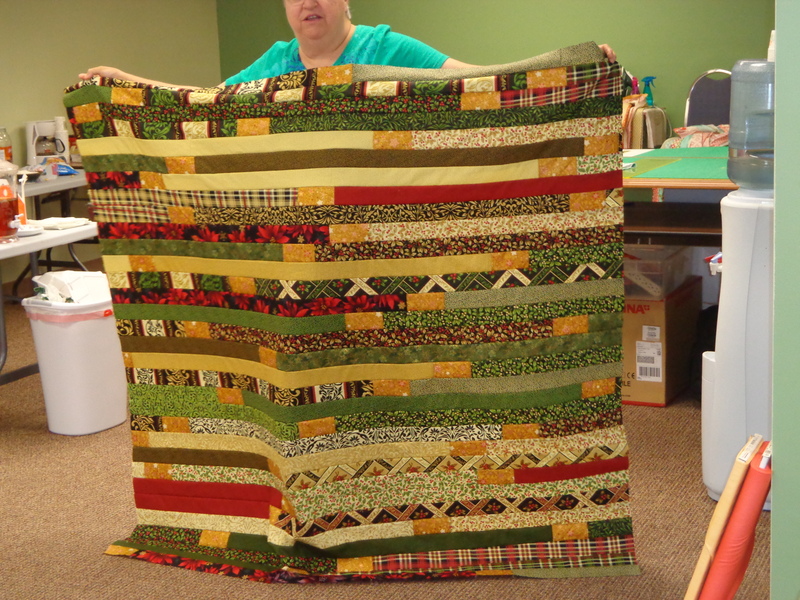 Then cut using the Missouri Star Quilt Company wedge ruler. And then tried playing with them. Wow, I had a post the other day called Happy Towel Day, and in that post I showed a lot of pictures to what I’m talking about with this episode. Maybe I shoulda waited to post those? Adam’s best known works is the trilogy in 5 books of The Hitchhiker’s Guide to the Galaxy. I LOVE the audiobook version of Hitchhiker’s Guide to the Galaxy narrated by Stephen Fry found on audible! The rest of the books are narrated by Martin Freeman (Arthur Dent in the movie). This series has caused its own fan base / cult following, and can be abbreviated as H2G2. The recent H2G2 movie that was made had some good points and was slightly different from the books (as always). 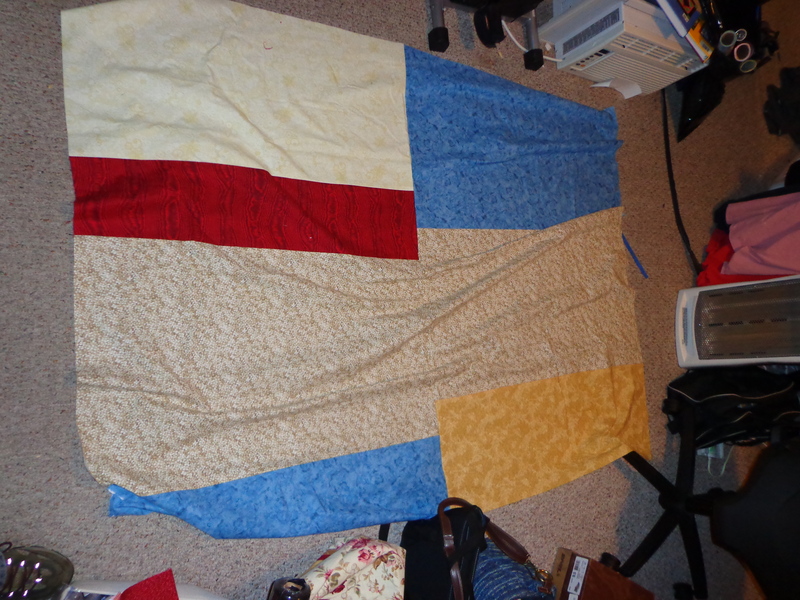 And the beginnings of a quilt. But you’ve SEEN all this in my previous post about Towel Days! What you haven’t seen is how this all works. 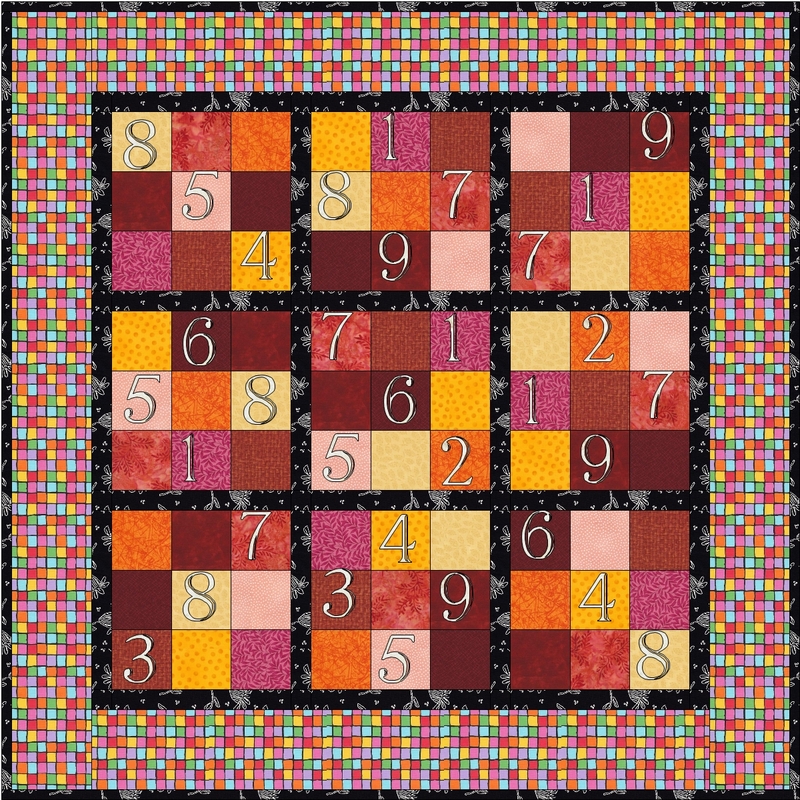 The Twist N Stitch Ruler makes twister blocks. 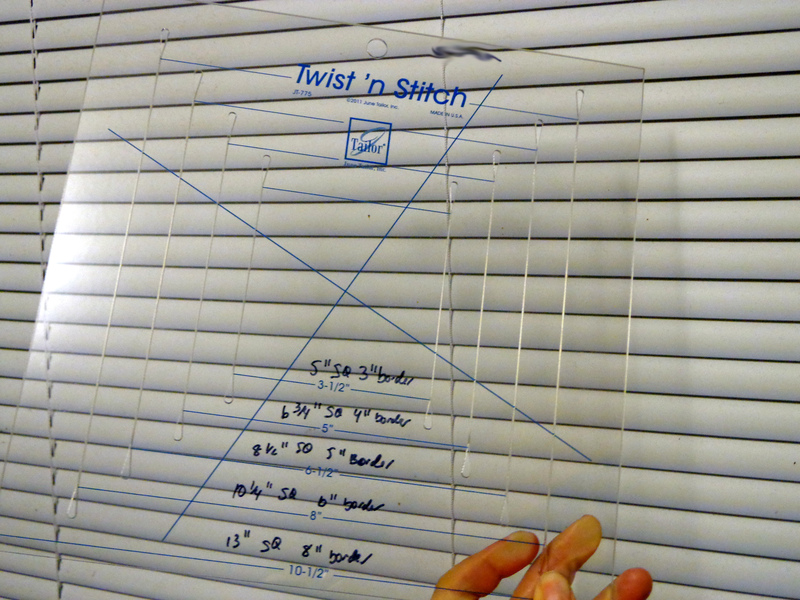 The Twist N Stitch ruler, if you can’t find it at your LQS can be found at Amazon. 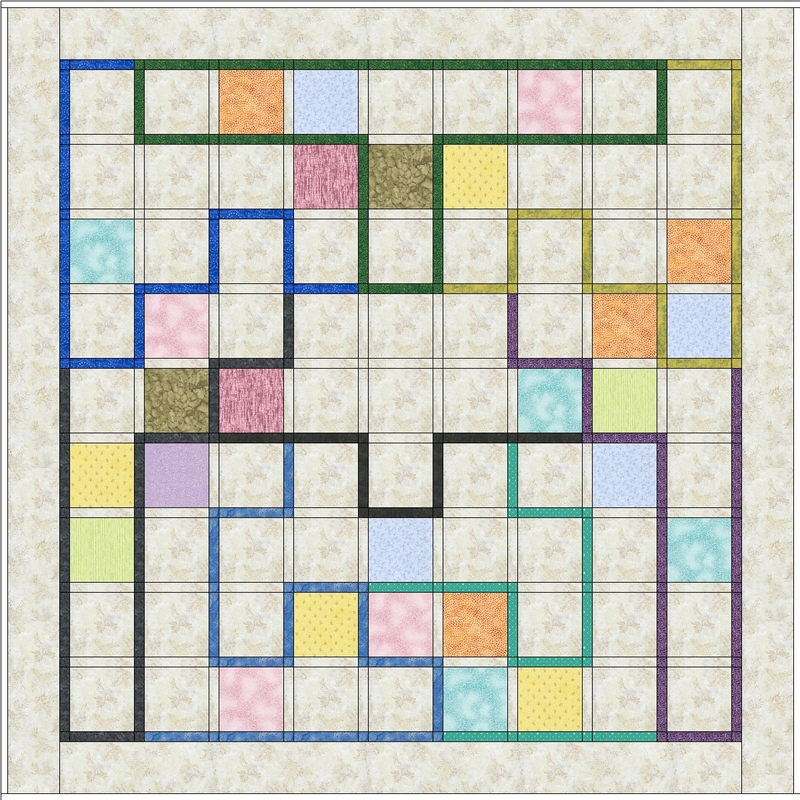 And it comes with this little paper guide that shows how to make your “pre cut” quilt of squares and borders. 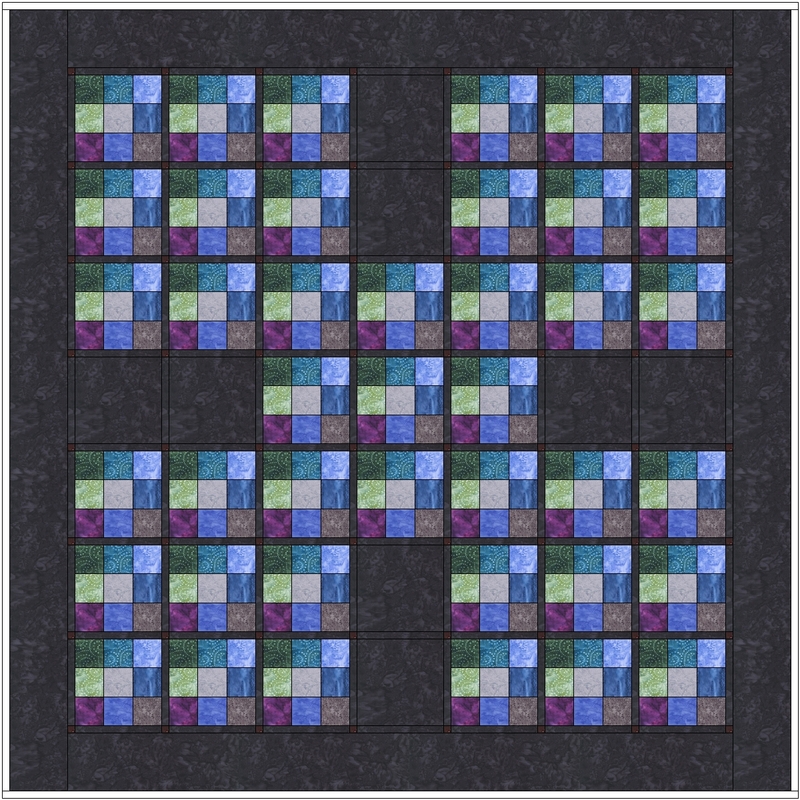 Each fabric transition is the center of a twister block. June Taylor calls these pinwheels, but somehow I just can’t bring myself to say that. There is a large section in the podcast where I discuss this technique of using the Twist N Stitch ruler. 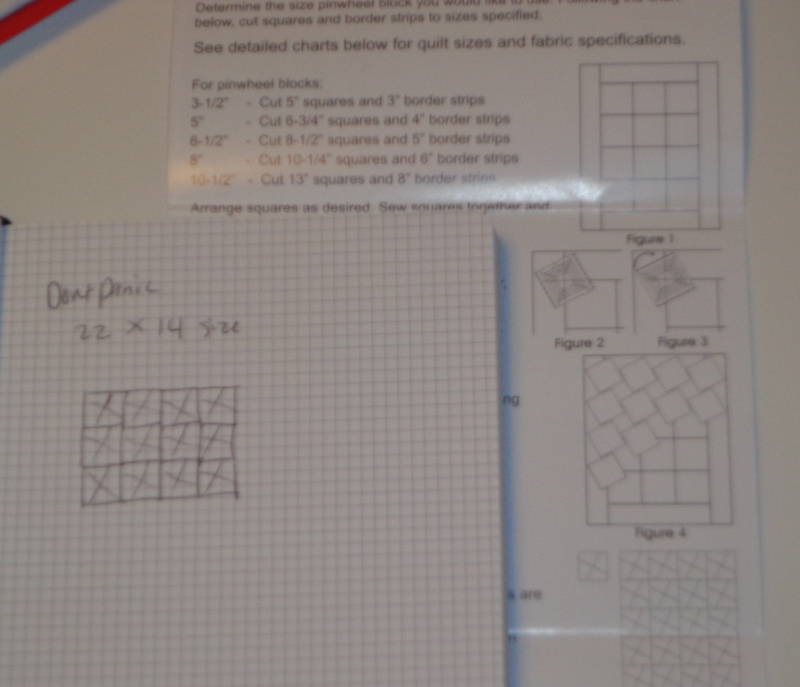 And compare it to the Shape Cut ruler, also from June Taylor. Here’s a larger one than I have. This really large one would be really nice! 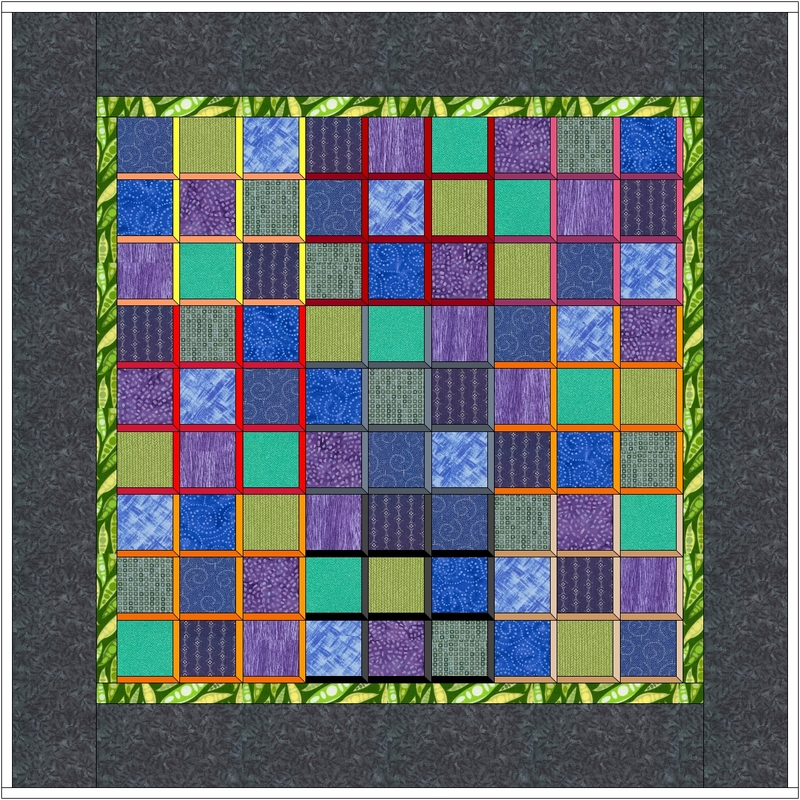 Look at the variations of Jack’s Chain quilt at my new friend, Annika’s blog: http://stofgenoeg.wordpress.com/ She’s got German and English versions of her posts. And lots of interesting designs too. CaithnessCraftCollective a big ol Hello! audio clip from YouTube Video So Long and Thanks for All the Fish. Scroll down down down to see the answer to Life, the Universe & everything. (If you didn’t see it in the previous post). Not the answer is pretty cool, but the image. Of the quilt. Which almost makes me not want to finish this quilt. 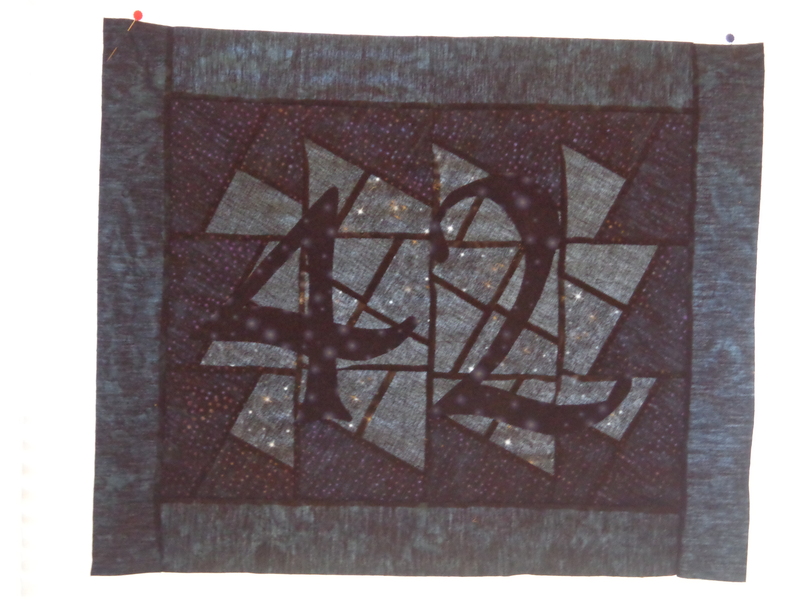 Quilt as seen on my design wall in front of a window with light streaming behind it (before backing and quilting). Isn’t that neet!? *editors note* due to the high number of pictures for this episode, I’m going to break down the blog posts relating to the episode into two posts. To find Part 2 of my renting a long arm episode go here. Part 2 directly relates my personal experience with my own personal quilt. The post below is more about the class and certification stuff you will find when you rent and to give you a guide through the experience. Have you ever wanted anyone to talk you through a long arm renting experience from beginning of the class to the end? Do you want to know what types of things to expect when renting a long arm, how to work the long arm anyway? 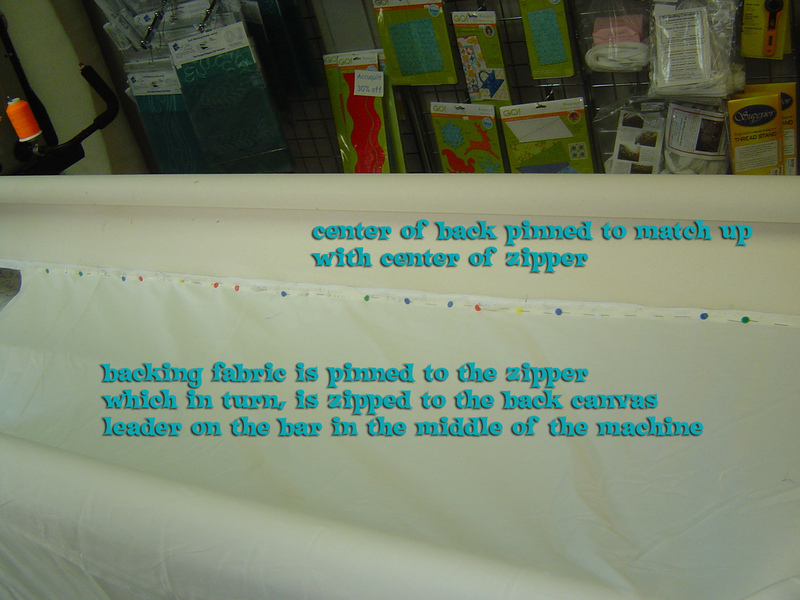 Particularly how to load a backing and quilt top and batting in a “half float” method of loading? 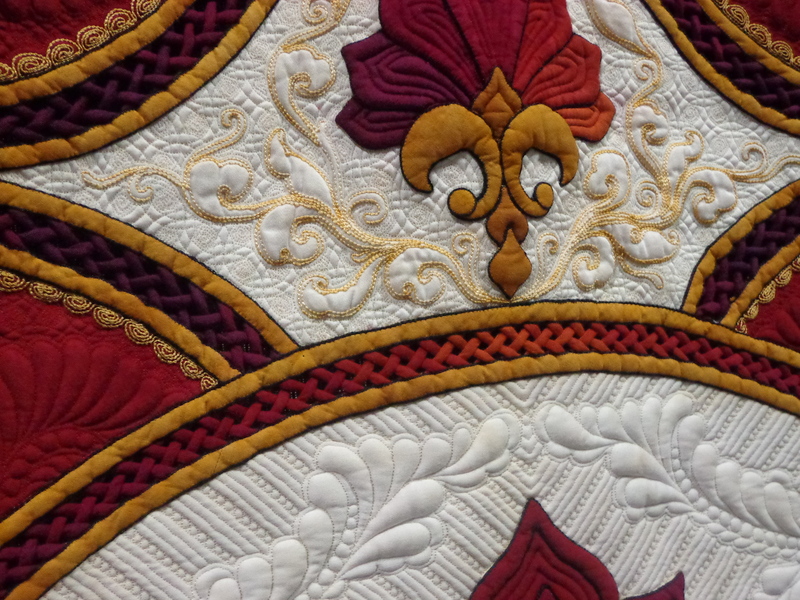 The episode I go into details about the things I learned in class, and if you scroll down, you should be able to find my pictures I took during the long arm certification class at Quilted Memories in Overland Park, KS. The shop carries batting, sells Nolting long arm machines, and provides time renting the long arm provided you took the class. The podcast and pictures are not meant to represent everyone’s long arm experience and are not meant to ‘side step’ any certification class by any means, but are to provide you with a very good idea of what to expect when renting, the steps involved with loading a quilt (there are many), and I think I even threw in some tips the owner provided us with for starting out (the ones I remembered or wrote down). 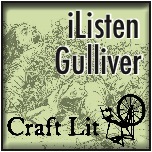 First in the podcast though, I talk about quilting and socialization and how I meat Jackie from Sew Excited Quilts. I sure would have loved to have gotten to spend even more time with her! She mentioned to me how interesting it is that ‘all these introverts’ are getting together and publicly putting themselves out there on twitter and podcasts. 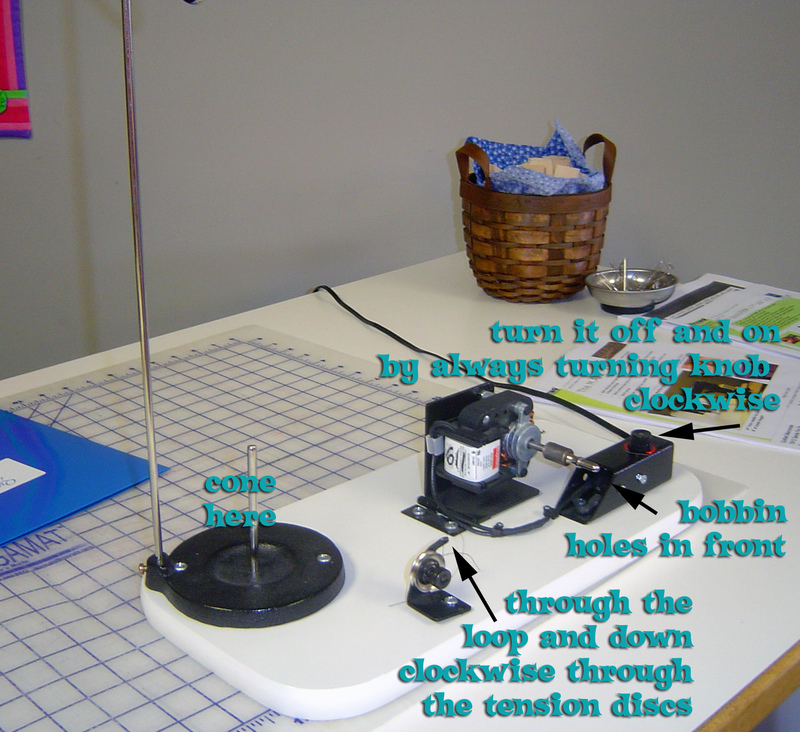 This is the turbo bobbin winder to make tight bobbins (easier for long arm quilting). Before loading, the back and top have to be pinned to the zippers. 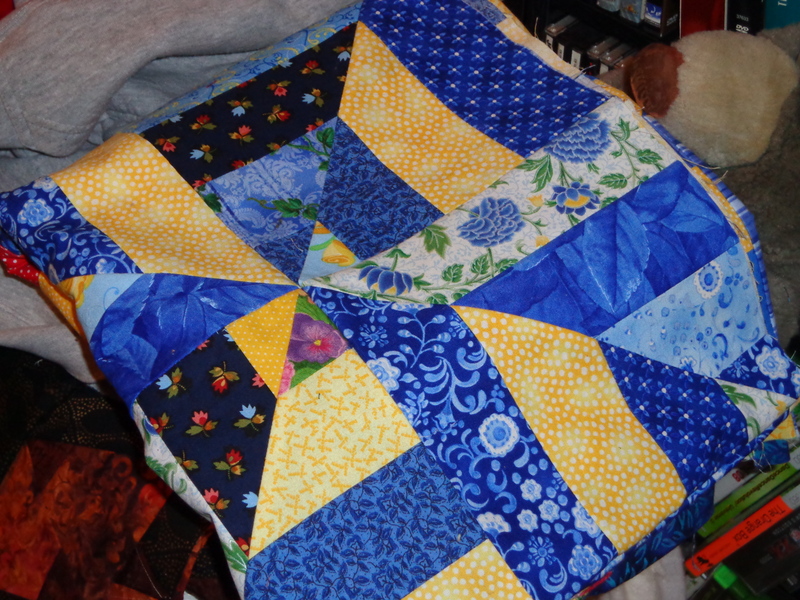 The quilt should be squared before pinning. 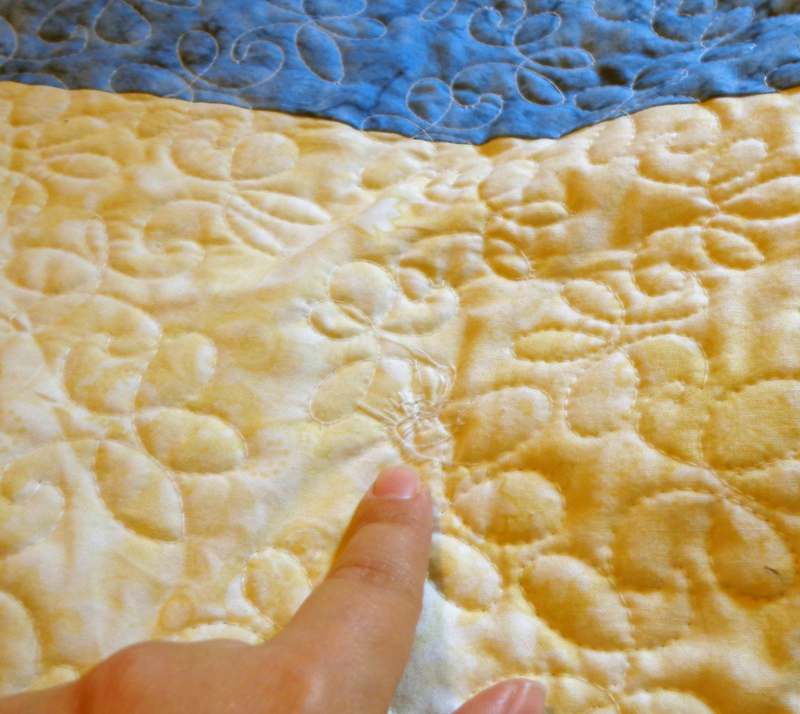 Fold the quilt in the center, mark with a pin, and then line up the center of the quilt with the center of the zippers. If you have your own zippers, mark your own center for the future. And the machine has to be threaded. There is some tension disks that should not be missed, but for Noltings, the one bar that has the most impact on machine tension is the silly bar that goes downwards on the bottom of the machine. Also no automatic needle threaders here. 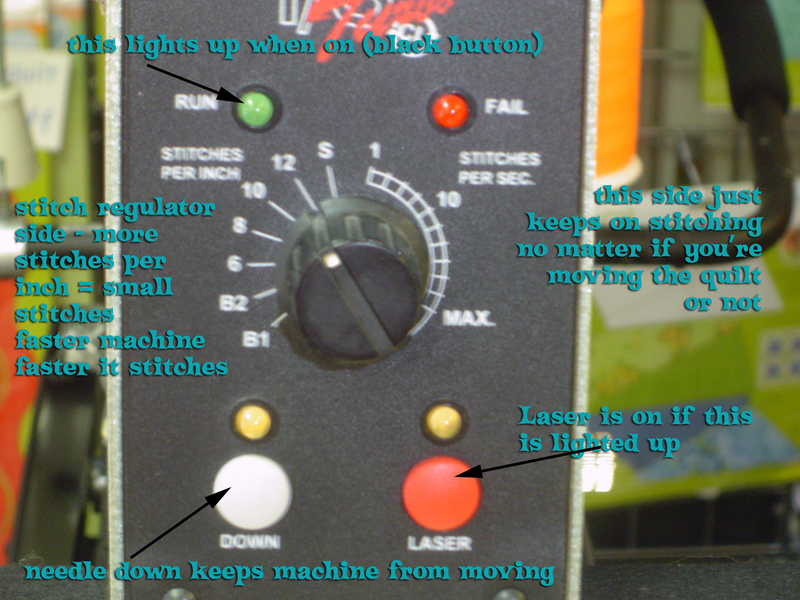 The display on the front (and back) of the machine shows on, stitch regulation, the “on mode” (didn’t catch the name), the needle down feature, and turning the laser on and off. Speaking of the buttons you press, here they are on the front side of the machine (close to the needle). Both the front and the back buttons put the red button on the left. as you’re facing the machine. 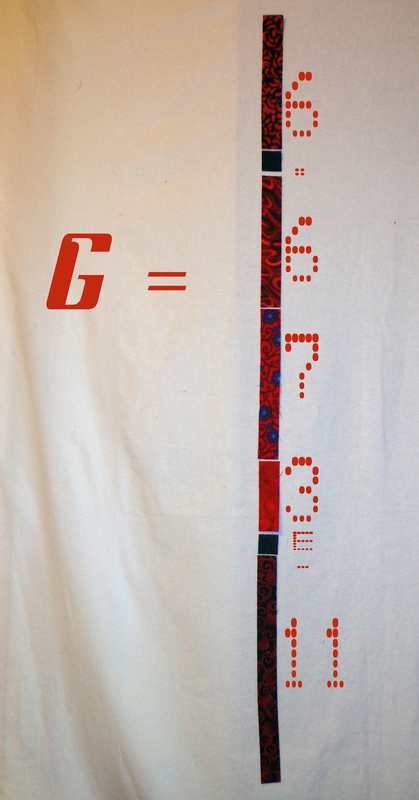 Red means single stitch and black means ‘turn it on or turn on stitch regulation). Stitch regulation won’t start sewing until the machine moves. 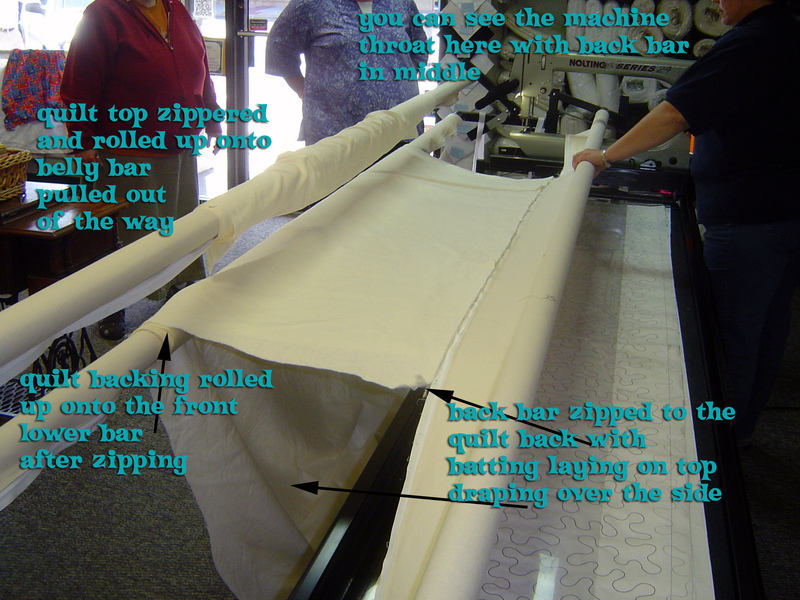 Then the faster the machine is moved (by you) the faster the machine stitches – matching your speed! When you want to stitch vertically or horizontally you can ‘channel lock’ the machine so it only moves one direction at a time. You have three sets of zippers, two for the back and then you roll the back onto the bottom front bar (1st picture), then you zip and roll the top to the top bar (belly bar). Then you place the batting in the middle (loose, but droopy). Then you baste the batting to the back (using channel lock). And then you baste the top to the back and along the sides. Once all the basting is completed, you take the clamps from the side of the long arm and clamp it to the backing fabric only. The white section is all a velcro so that you can adjust this correctly. This should be tight but not stretching out of shape. 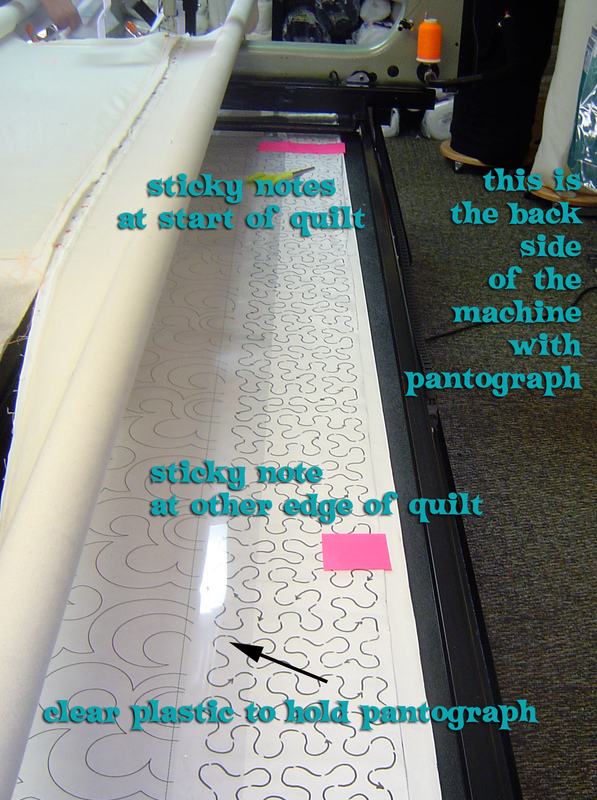 Then you can set up the pantograph on the back of the quilt. 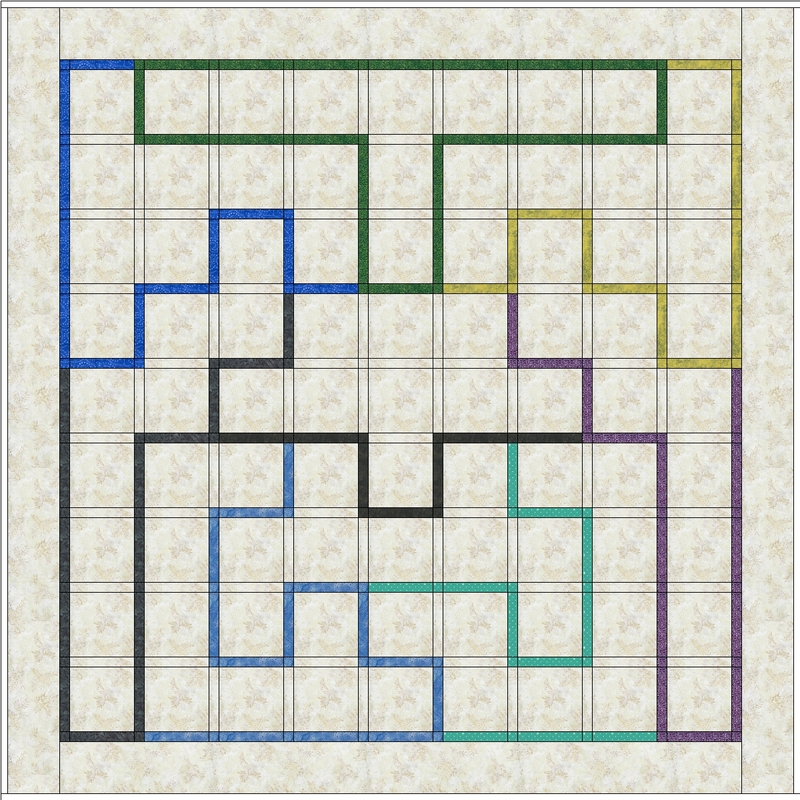 You can move the frame around and set up sticky notes to help you figure out where to start and where to stop quilting. A view of the laser set up next to the thread spool. And here’s a fuzzy picture of the laser engaged. 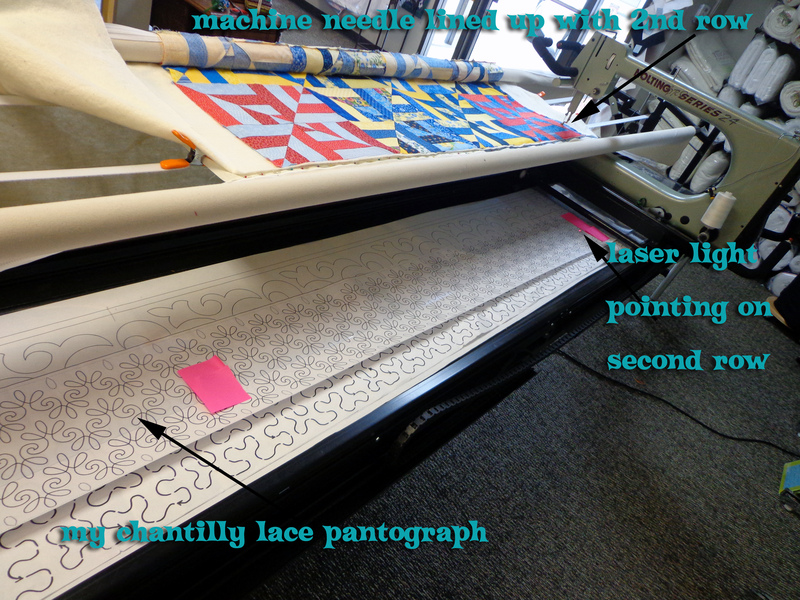 Once one pass through of the panto, you need to find your starting point on the pantograph again, move the machine down to the end again, and secure the threads, locking them in place. Then you have to move the laser again back to the same point over the pantograph. For some reason this is hard to wrap my head around just a little bit still. Probably because the laser wouldn’t behave all that well. Next time I’ll put the spool on the other side away from the laser and that may help a bit. Lyn was helpful in letting us see the batting choices with sample Hobbs battings. We felt the bobbin, and several different weights of thread during the class. 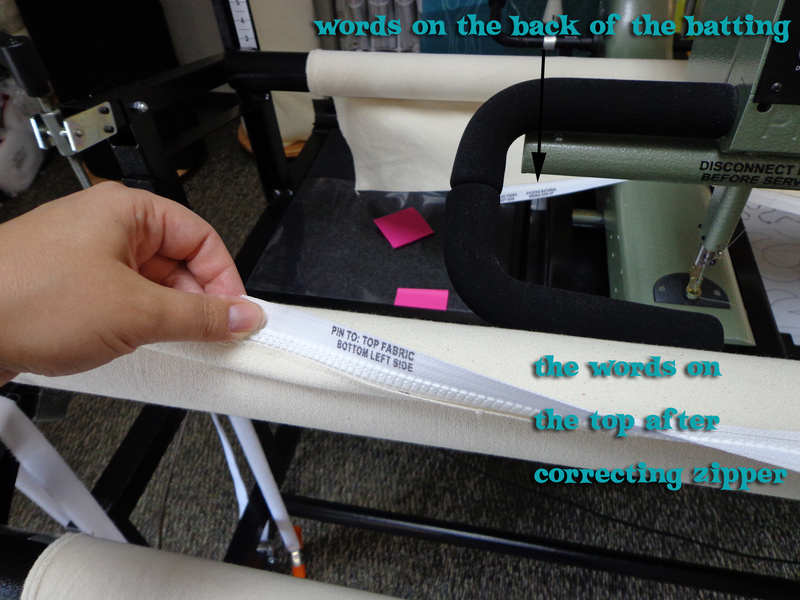 We discussed tension issues and how much threading the machine matters to help the tension in the machine. We took the zippers and pinned them to the ‘beautiful nine patch that a customer did’ (ie the whole cloth muslin that was squared up prior to coming to class). To square it up, she said to fold it lengthwise, then keep folding it carefully with one edge always to the outside to get it on your cutting mat, then use the rotary cutter. Then unfold it, refold it shortwise (the other way) and then keep folding it until the uncut edge can fit on the cutting mat, and keeping everything square with the previously cut edge, rotary cutter the new edge. 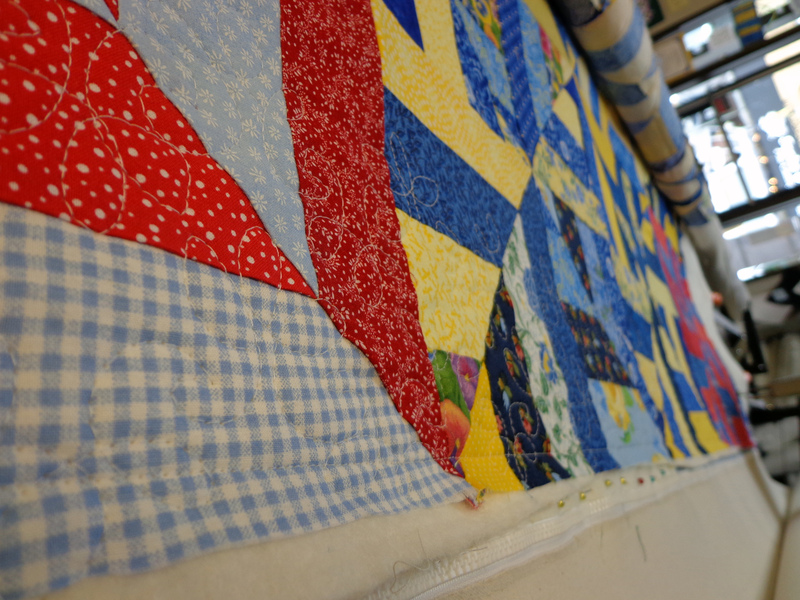 The zippers were marked in the center and the squared up quilt top was marked in the center and we pinned from the center outwards. We wound a bobbin with the turbo bobbin winder. We each threaded the machine, even though she encourages us to leave an end for the next person to tie up to (similar for leaving thread in sergers). We helped zip up the quilt back to the leaders on the machine. 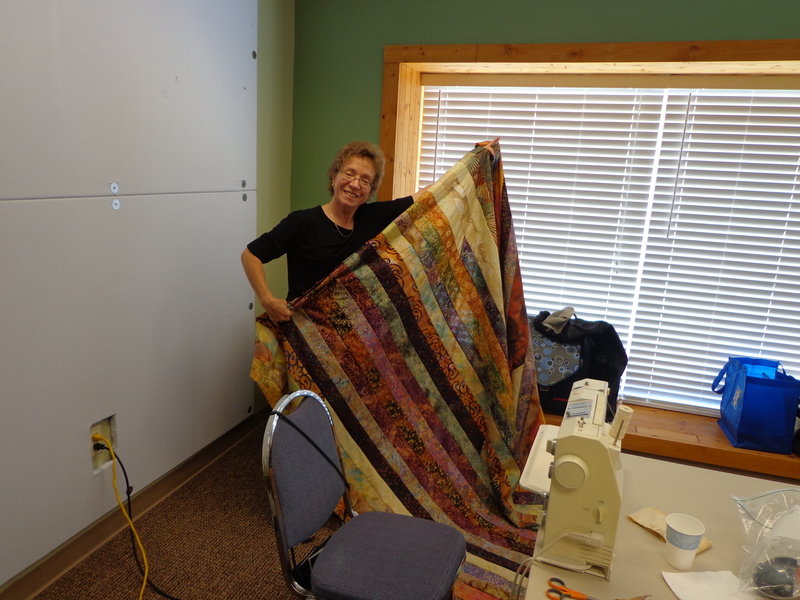 We each rolled up sections of the back and pushed out from the center, smoothing the quilt to each edge so that it was square on the machine. We zipped up and rolled up the top in the same way as the back. Lyn inserted the batting up next to the backing. 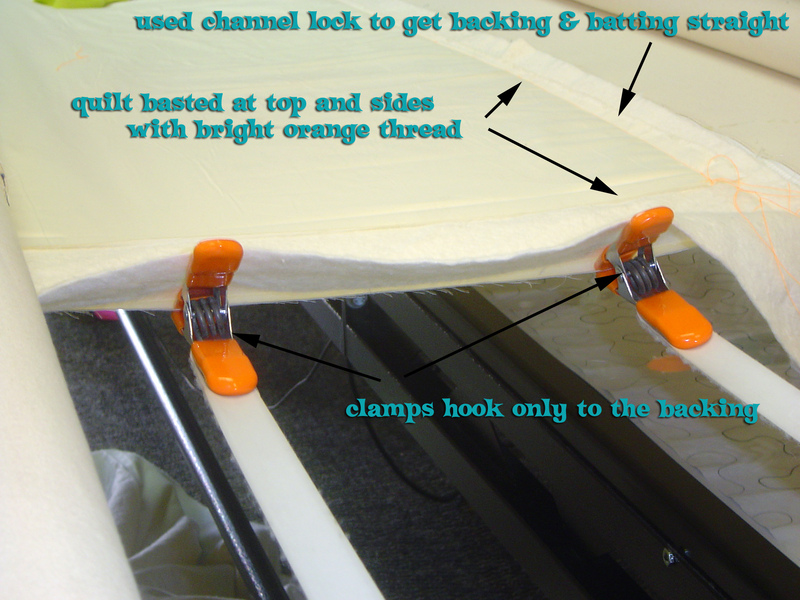 We each helped baste the batting to the backing using the horizontal channel lock (moves sideways only). We pinned the top to the batting and backing. We freehand basted the top horizontally (no channel lock) and Lyn said that to help get waves out sometimes she zig zags when she bastes the top to help get the fullness in, zigging up and down, while the direction we basted was still to the right. We basted the sides down over the section we could see unrolled. 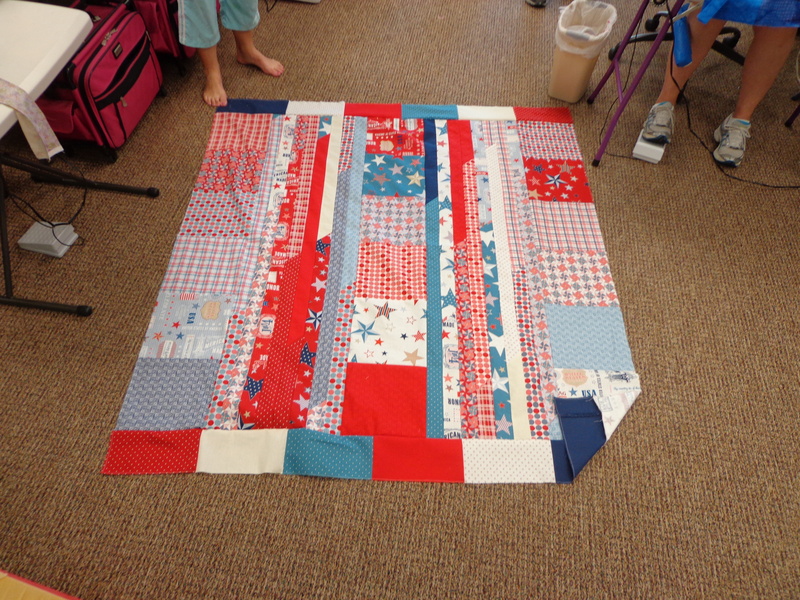 We put the clamps on the quilt backing on both sides. We put the ratchet down and belly bar moved to be in line with the bottom bar. 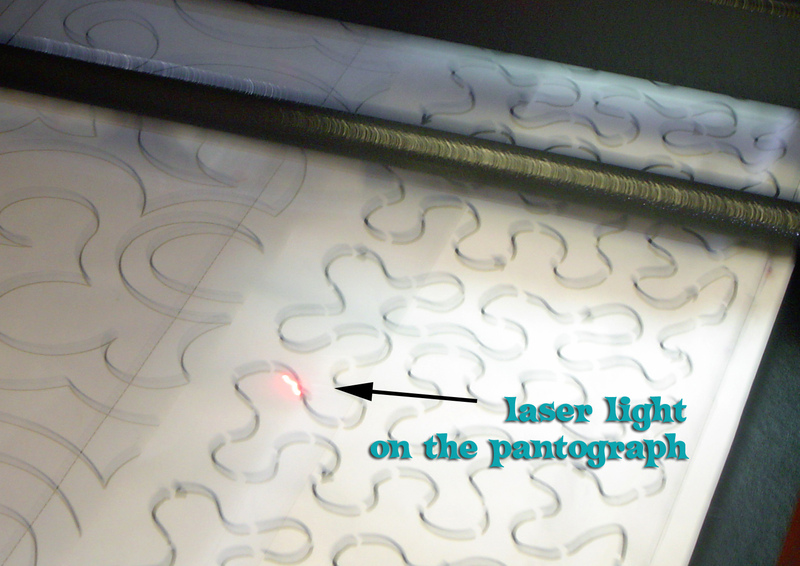 We repositioned the laser on the panto, marked the beginning and end of the quilt with sticky notes. 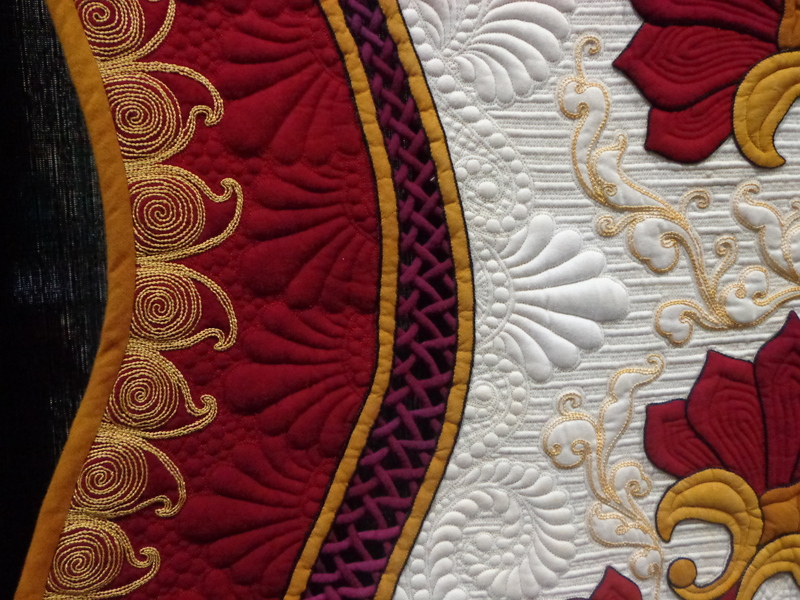 Each of us got a turn at moving the quilt with the pantograph, quilting on the back side. We would stop and see how we were doing on each section. We rotated a few times for this part. We discussed how to move to the next pantograph, but did not get to practice it due to time (we were late getting started). 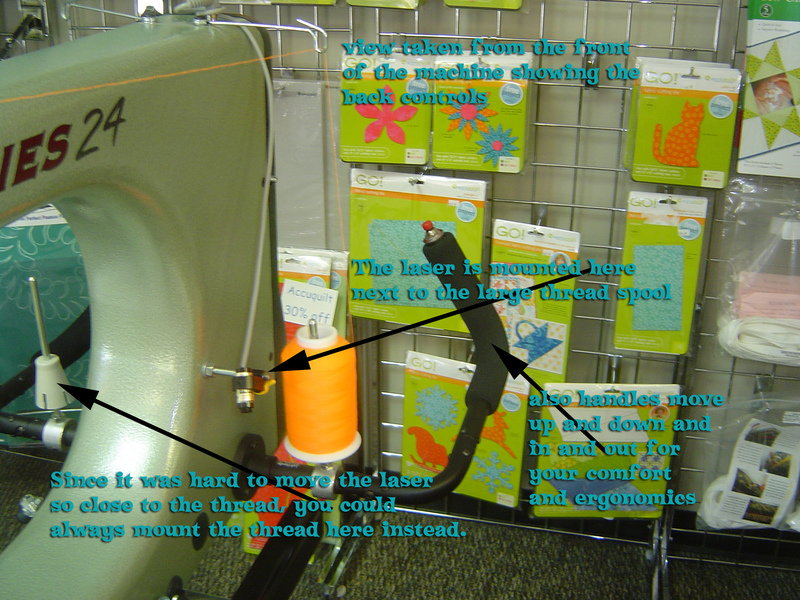 Then we went to the front of the machine, and our group was having issues remembering the sequence we used for starting and stopping the stitching, so we each practiced four times (using two long arm machines) pulling up the bobbin thread, then locking the stitches, then moving an inch or so, then locking the stitches and then pulling up the bobbin and cutting off at the end. While we were practicing this, she was drawing on the other side of the ‘quilt’ with frixion marker (not pen, but same difference) some ‘free hand designs to try. One was an ‘l’s and e’s’ design a cursive l followed by a cursive e, then repeated. The next design was a circle looping clockwise next to a circle looping counter clockwise. I think the last design was ocean waves. 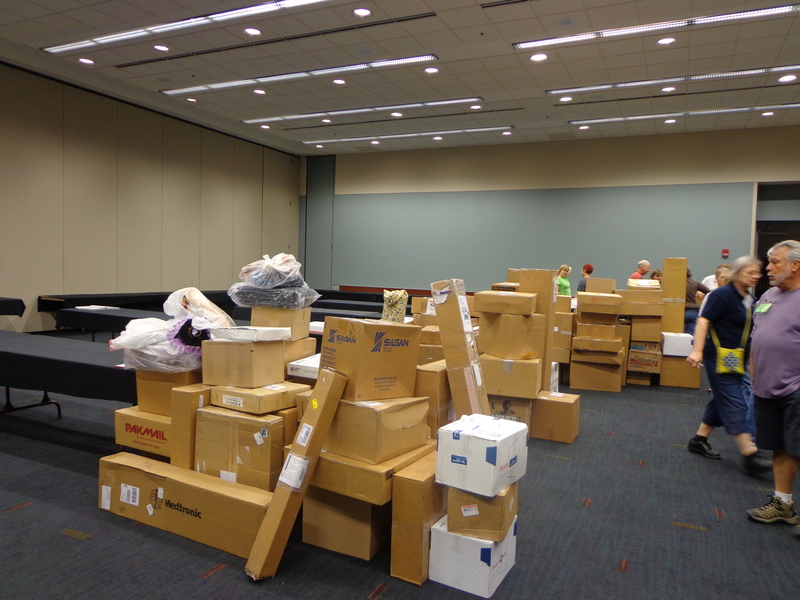 We had discussed but did not get a chance to practice moving the quilt on the bar to reposition it. But by this time, I wasn’t taking it in. The ratchet system still seemed unfamiliar to me, and part of it may have been the late start and the fact that the family of one of the ladies was there to pick her up during the last 20 minutes or so we were out on the floor. And the rest of it may have been it was near the end of my normal day and I typically stop paying as much attention the later it gets, and the fact that there was so much to think about during the class too. 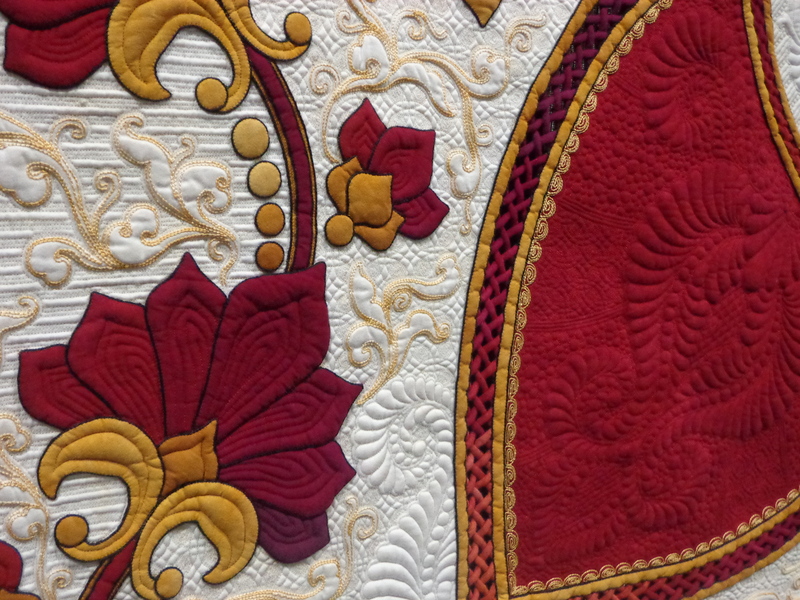 So this was the one area that I wish I had gotten to practice myself, the moving of the quilt after a section is quilted, and how to handle and practice moving the pantograph to the next section of the quilt. Otherwise this class prepared me for actually renting the long arm. I bought my zippers and two generic threads – off white and black (for me this seemed more useful than grey) and signed up for 4 days after the class (which I changed to 6 days). 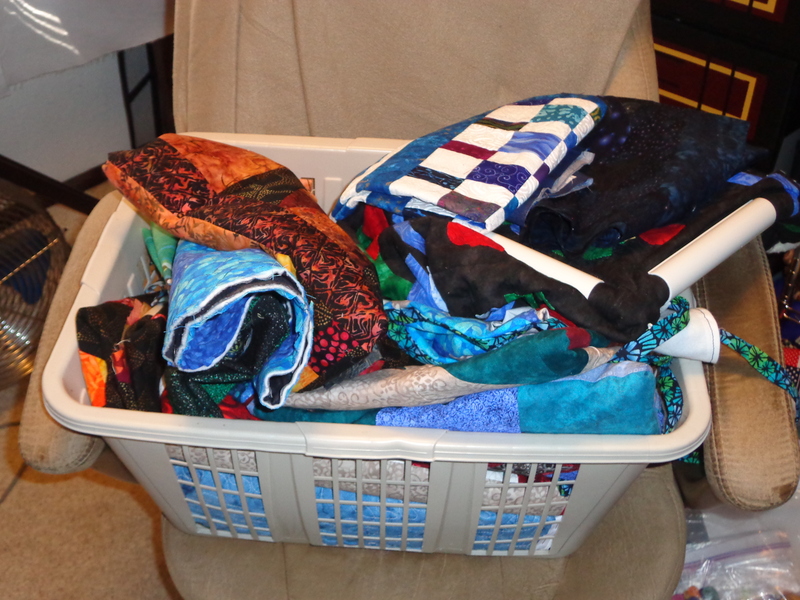 This is all the pictures taken from the long arm class itself, to see what I did on my own quilt during the first rental time, go to part 2 of this post. *editors note* Due to the high number of pictures in this blog post, this is PART 2 of a two part blog post about renting a long arm machine. Both parts relate back to the same episode of the podcast. You can find Part 1 of this blog post about renting a long arm here. 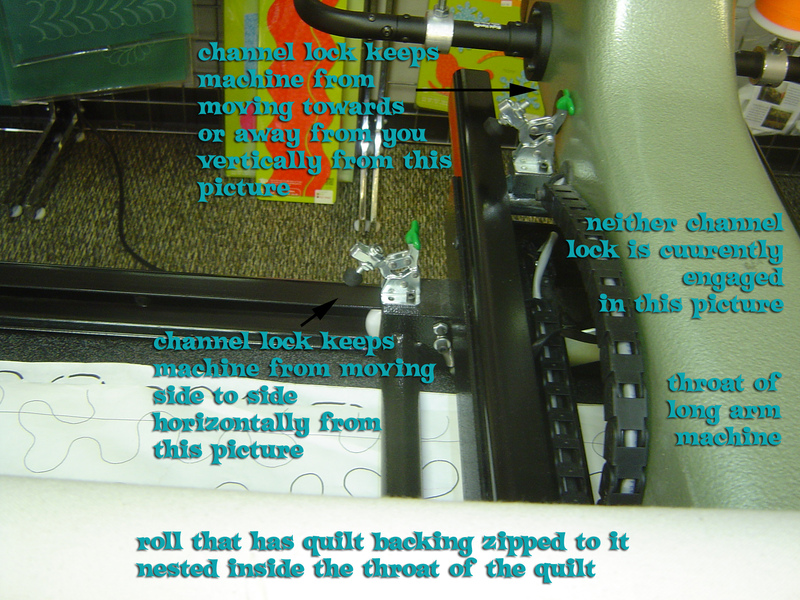 That post shows the parts of a long arm machine and how to set up a practice quilt that I took in the long arm certification class. 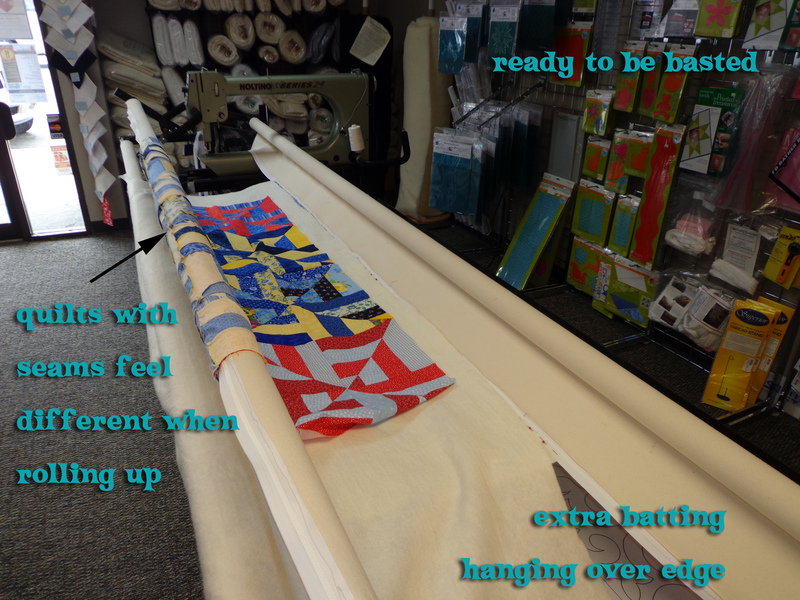 The part below is my direct experience with the long arm I had for my own quilt. This post is not intended to be a sidestep from you completing your own long arm certification class, but is supposed to help you understand what all you’ll have to do and learn once you get there, and potentially get a leg-up on your experience. 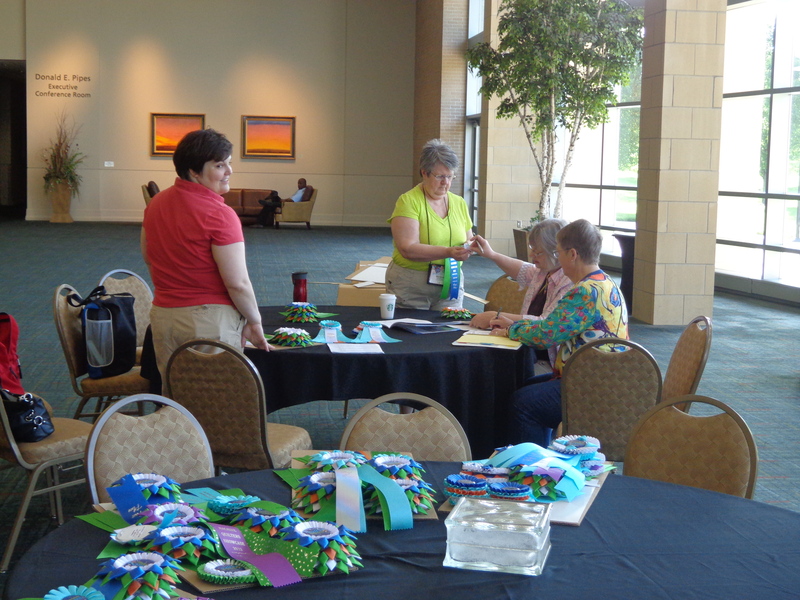 You bring scissors, and pins and a pin cushion, just in case you make a mistake with how you pin or forget to pin. 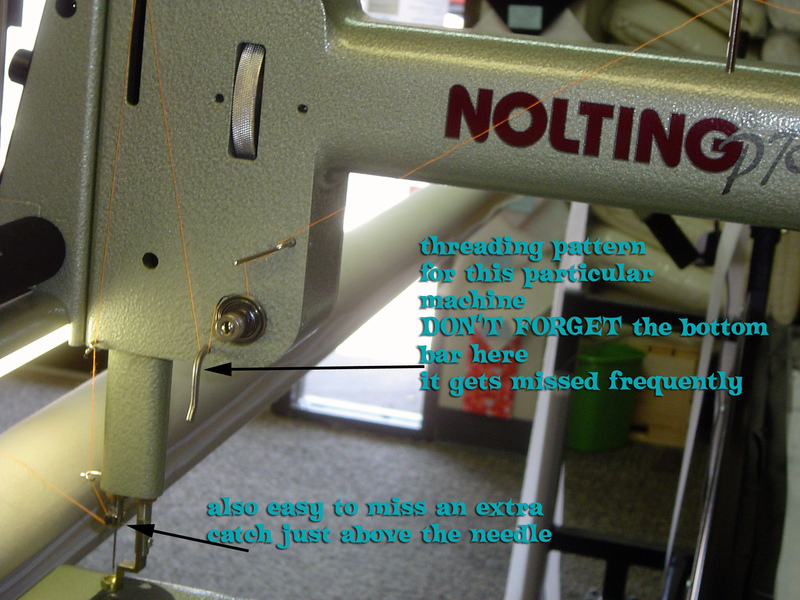 You can wind your bobbins during the time you’re renting or buy prewound bobbins. For this machine, you use their bobbins, but if you take any you can purchase each bobbin for a dollar. 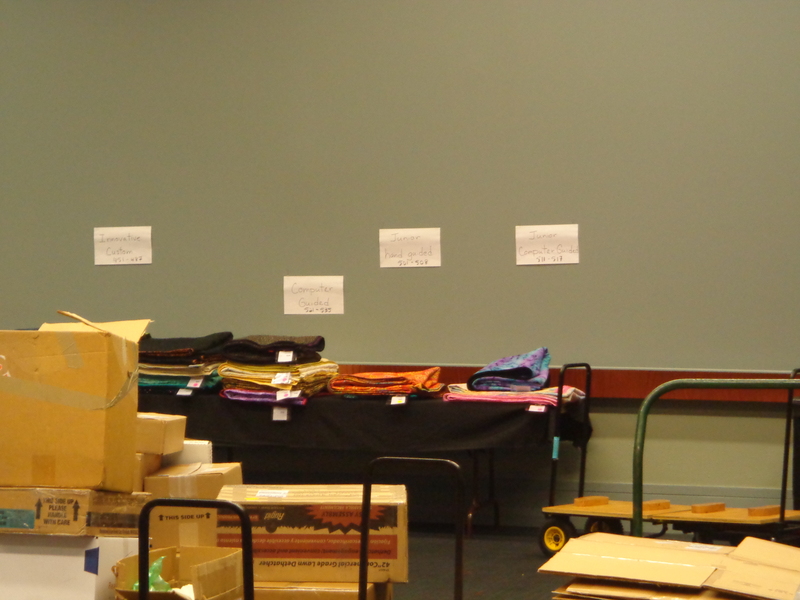 At the end of my session I ended up buying three bobbins from them after winding it up. I suggest for the sake of time (learn from my mistake) that you go prewound or get there early to wind bobbins. If you’re densely quilting then even for a small quilt (lap sized), you’ll go through 4-5 bobbins. So my first quilt, the one that I knew I was going to make “all these mistakes on” was one from all of you! Well one from my partners from the first swap bot swap we did back in December of 2010. 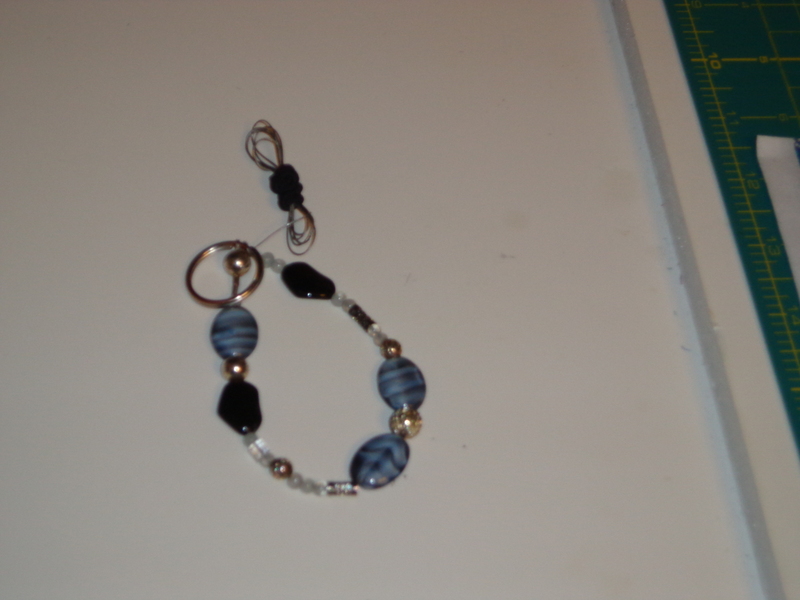 Well the backing wasn’t made, and by suggestion I used 1/2 inch seams and pressed to the middle. 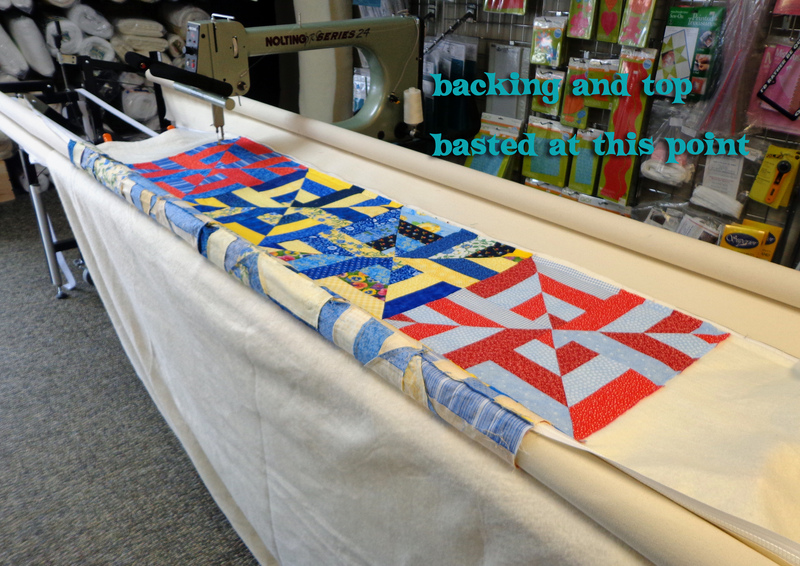 If I wanted to, I could have also used a slight zig zag stitch in making the backing. I STRESSED about completing this in time for the quick turn around needed to take my class. 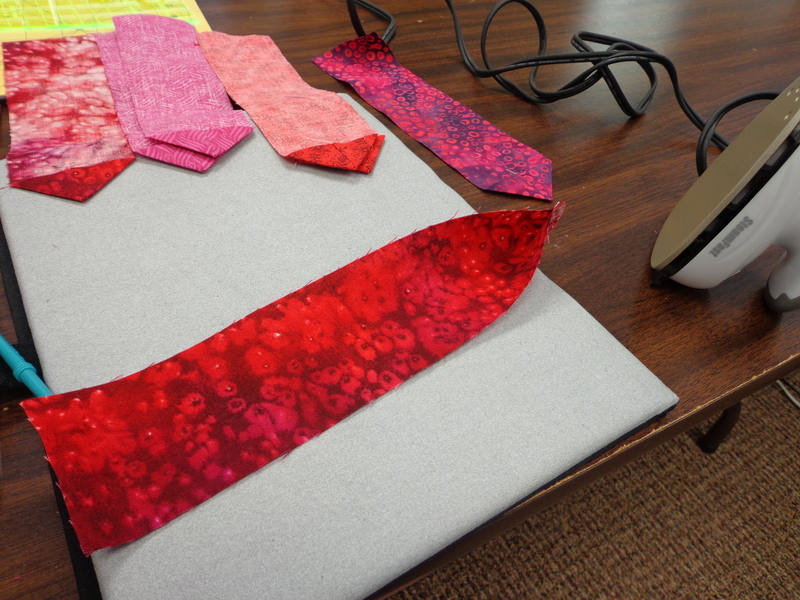 But after pushing back the time two days, I did finish this and square it up and put the zippers on before my class. 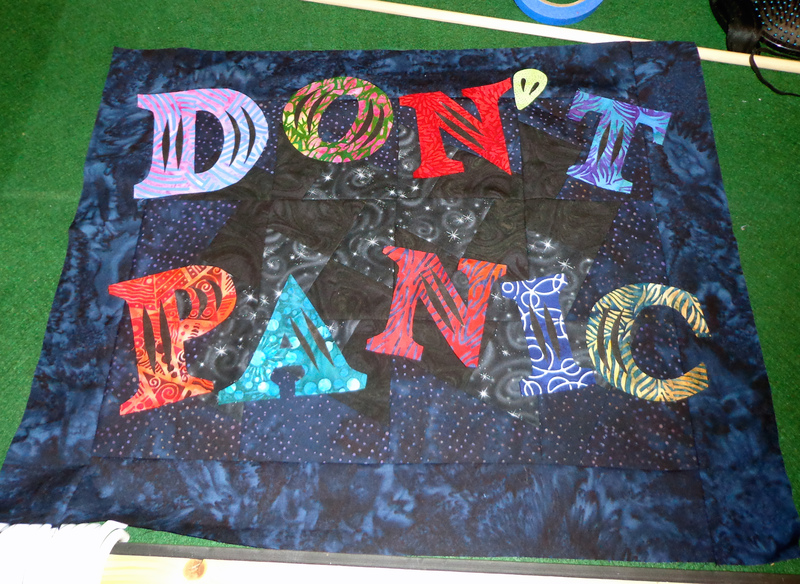 I put the zippers on the longest two sides of the backing fabric, putting the words to the left. But somehow before class, I had the top put on wrong because I was confusing top bottom front back around. While I didn’t get every step on my camera, this is after I have rolled up the bottom and the top and put the batting in place. And so when I got the quilt basted down, it’s so pretty on the machine (took quite a long time to get to this point due to unfamiliararity)! I couldn’t remember at what point I needed to put the clamps on, it’s done after the whole thing is basted down. 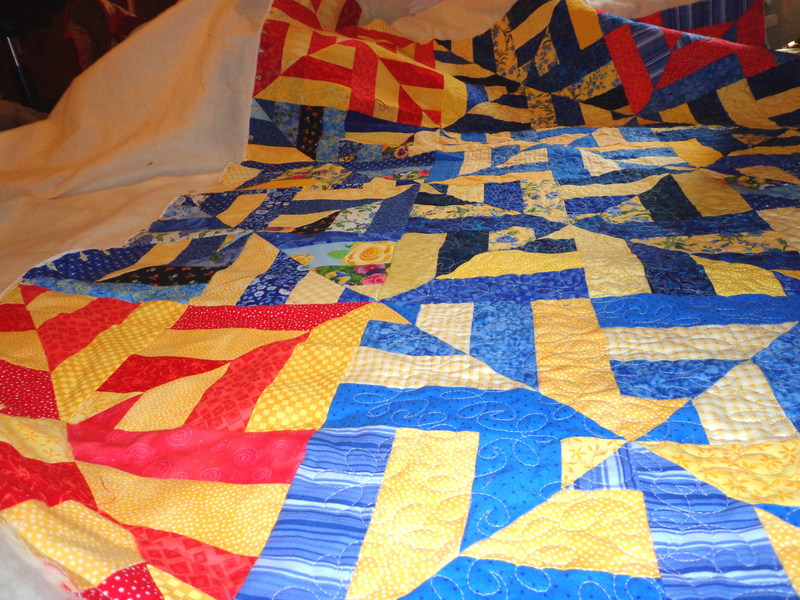 I also needed reminding about how tight this quilt needed to be in terms of the tension (I had it a little bit loose). She commented that when the machine is under the quilt, it should ‘show up’ underneath it a little bit, which you can see faintly below. So I chose to do one of the three pantographs that I had purchased for myself. This one is called Chantilly lace I believe. I just set up the pantograph right over top of the shop’s meander one. Three loops up, curve, then three loops down. Easy enough. 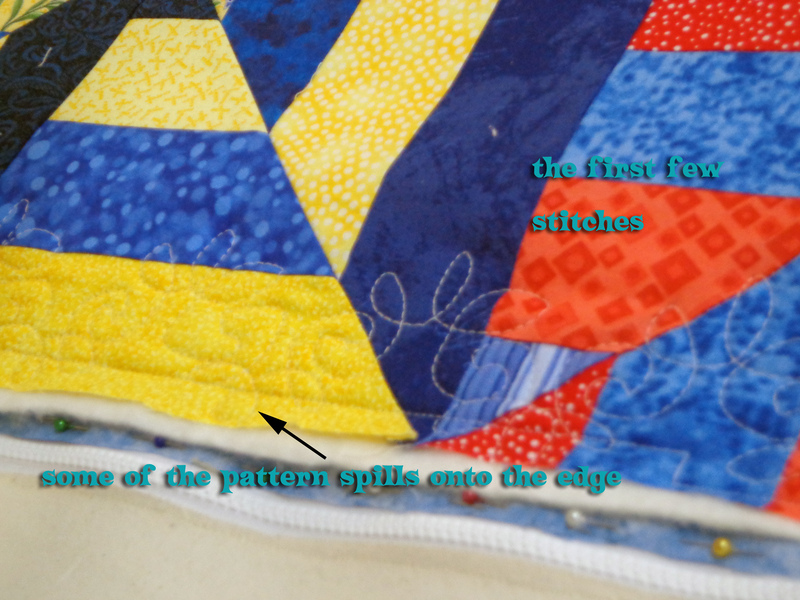 I started pretty close to the edge of the quilt because this quilt has no borders, which I suppose is almost a mistake in that some of the points will be taken up by the binding after the quilting. Two rows in and I was mesmerized! The only really big problem was when my bobbin thread ran out faster than I was expecting. Tension before the bobbin and then right at the bobbin change there was tightness. I should have ripped it out under the machine or something, I think I got the bobbin stuck and then wasn’t comfortable with pulling it up. if I do rip, it will only be this very very small section. The rest of the tension looks good. See the backing on the red below. I was told by the owner that she thought I did a wonderful job. She was impressed at the speed I went during the stitching and didn’t hear the motor rev up too fast at any one time to try to catch up to me. This is about 8 stitches per inch. About up with my 2 hour slot, I asked to pay for another hour of time and was granted it. I completely underestimated the number of bobbins to wind and mid way through what I stitched had to wind some and then at the very end decided to wind two more for next time. 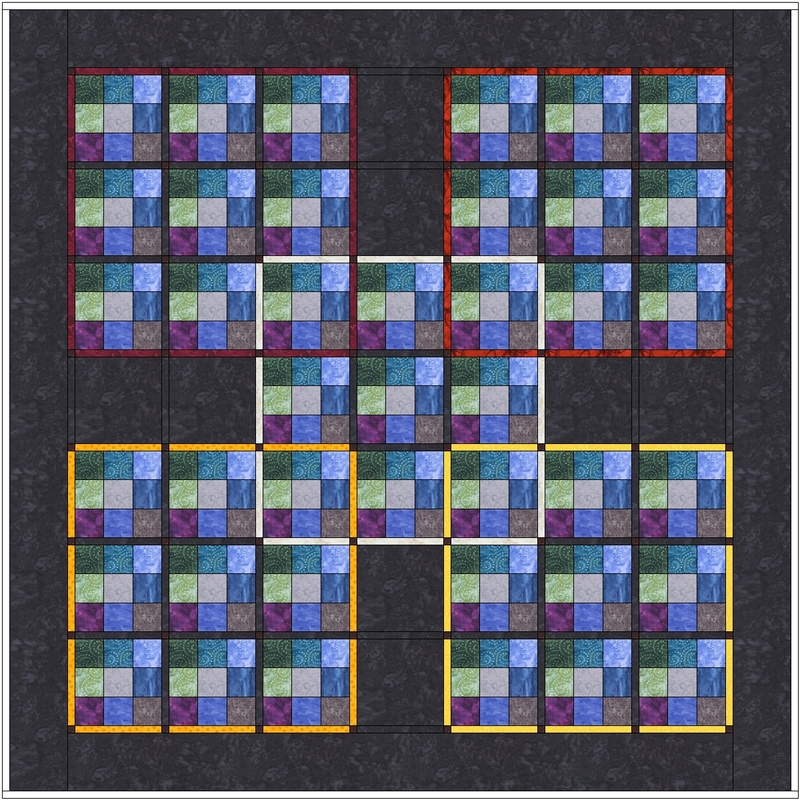 I did not complete this quilt. it’s about a yard and a half long by a yard wide, and I’ve made it two thirds of the way at this time. If I was using the generic meandering pantograph that we used in class, I would have been done by the time I left. I suppose part of my ‘slowness’ is in the fact that I was trying to remember all the details myself before asking for help on things. 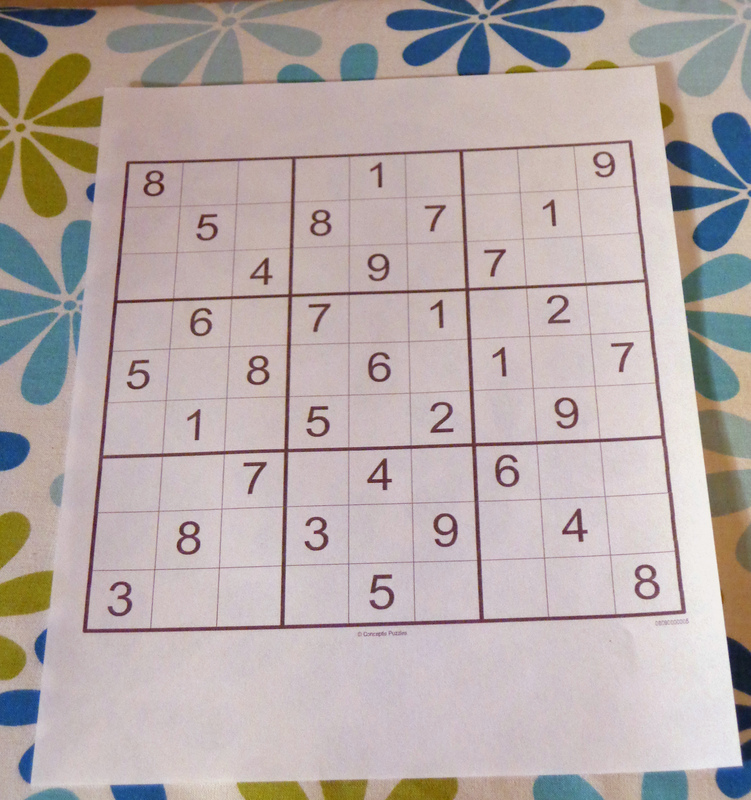 This meant several times looking and staring at the machine, trying to visualize how it was during the class itself. I know now that I can get the zippers done correctly for next time because I have a much better visual picture in my mind of how they’re pinned on. We discussed it and practiced it in the class itself, but I did not visualize the direction of the zippers at the time of the class which is why it was forgotton. I also spent time taking lovely pictures for all of you! I was trying to be aware that my rental time was precious and costing me $, but after finding myself a true blogger, I really couldn’t go without documenting the process. Next time, I’ll probably get pictures of the ratchet system although that’s less of an issue for me to remember (the one part of the class I completely blanked out on for certain) now that I’ve had to do it once. And maybe because I failed to take pictures and notes about that part of the process. Both times. I agree that this is a large investment. I invested $ in the class itself, two large cones of thread, three pantographs (2 more for the future), three bobbins, the rental zippers, and probably more. I invested time in learning it, time in trying it out, and time in figuring it out. But in the end I learned a new skill, which is invaluable to me! 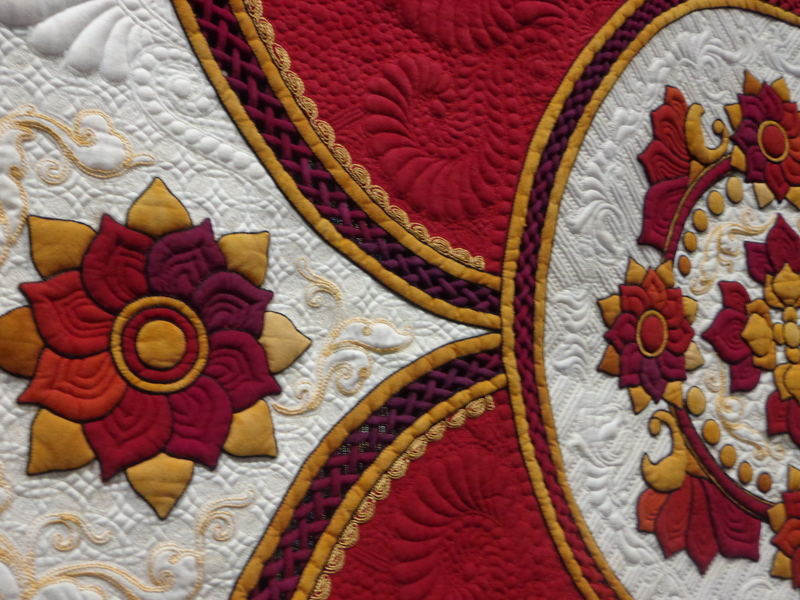 I love learning skills and how quilting teaches all of us something new ALL THE TIME! I learned that I get grouchy when I don’t give myself enough time to adequately complete a deadline for making the bottom, quilting has to be much less deadline oriented! In case you missed it, the first part of this post where I took the long arm class is found here. You are currently browsing the archives for the Podcast Episode category.